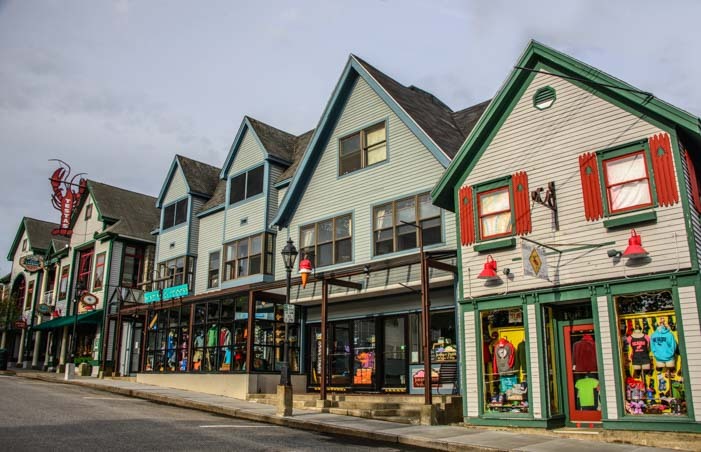 Eastport and Bangor – Off the Beaten Path in Maine! 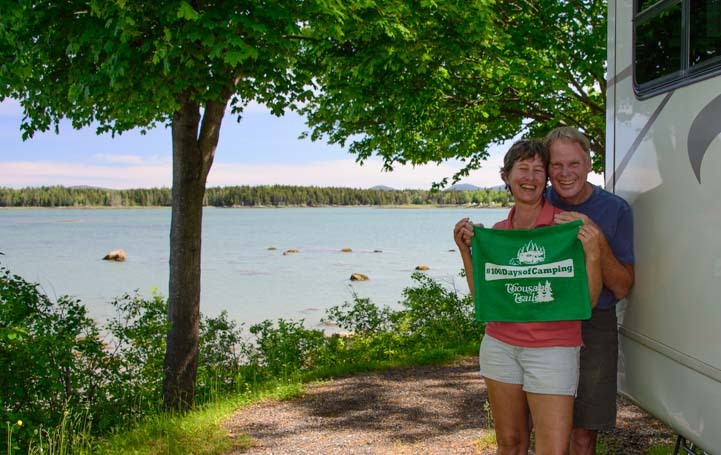 July 2015 – When we returned to Maine from our RV roadtrip around Nova Scotia, we did some sightseeing while we waited for our new trailer axle to arrive at Harvey RVs in Bangor. We parked the rig so we wouldn’t have to drive it around on its disintegrating tires, and explored some of the lesser known spots downeast. It was great to be back in Maine! 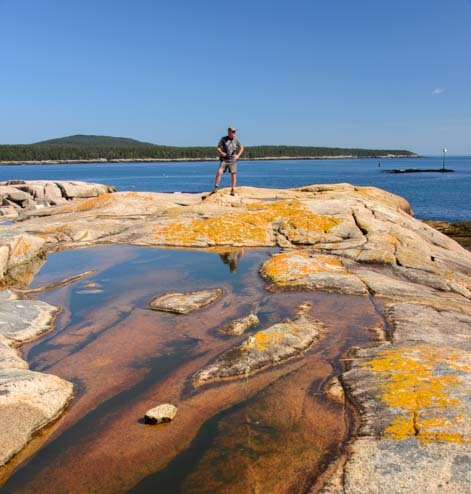 The whole northeast end of Maine is made up of skinny peninsulas and islands, like bubbles of land floating in a bath of water. It’s not always easy to see the ocean, because the woods are so thick, but whenever the vistas open up, the water views are lovely. We spent some time prowling around the wonderful little seaside town of Eastport, and we were floored that everyone we met in the streets, in the bakery and at the library booksale were all locals. 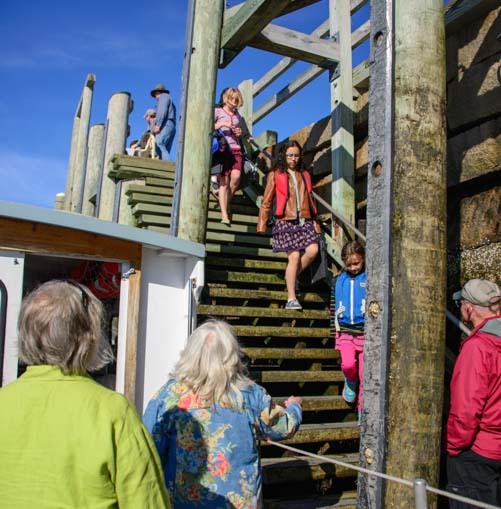 Easport is home to just 1,300 people, and one woman explained to me that their main wharf had been severely damaged in a storm and that that had affected the number of visitors they saw. The Navy ships couldn’t come in any more and tourism was suffering. 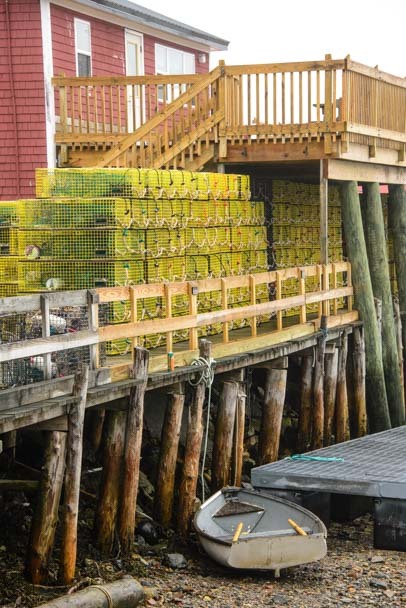 “We aren’t seeing nearly the numbers of visitors we used to,” she said, adding that it would be a while before the wharf was fully repaired. 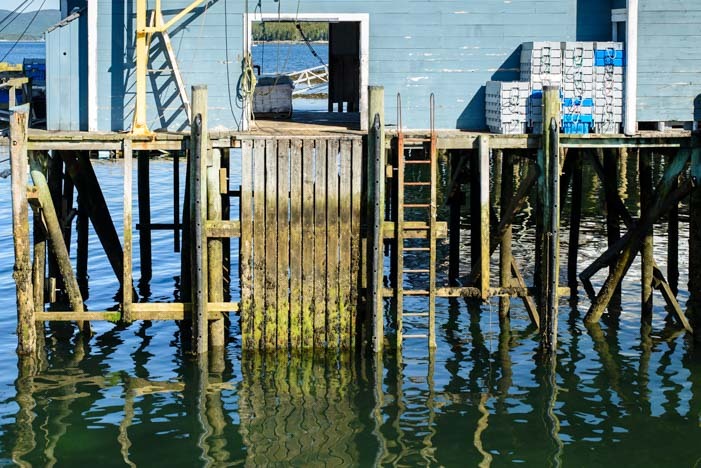 I was amazed that something as basic as a damaged wharf could impact a town so deeply. What a shame, because this is one really sweet town. Eastport is wonderfully tranquil and very friendly. It also has a fun spirit. 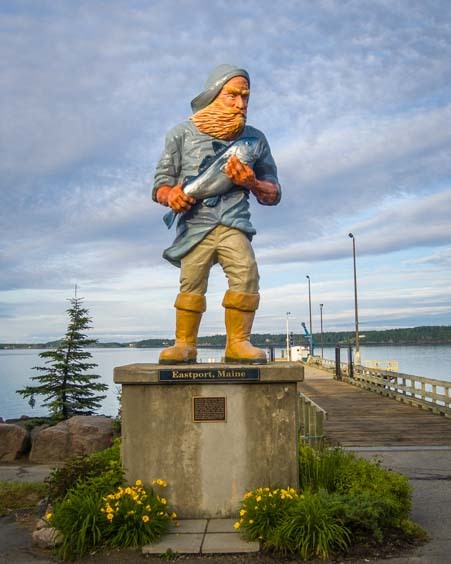 The town dock has a statue of a fisherman holding a large fish. This isn’t just any old fisherman-with-a-fish statue like you see in so many seaside towns, however. It was created as a prop for the 2001 Fox reality TV contest, Murder in Small Town X! Sculpted by Jeff Poss, a group of citizens saw to it that the statue remained on the dock after the show was over. This fisherman statue was originally a TV prop! 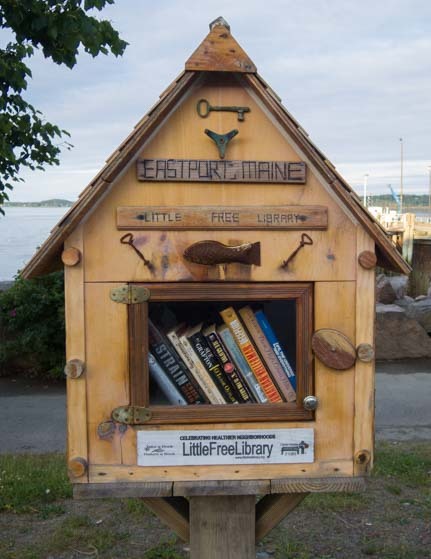 Just a few paces further down on the waterfront we found a delightful little library lending box. Lots of places have bookswaps where you can take a book from a bookshelf if you leave one of your own behind. But this one is special because it is a little mailbox style box on a post right on the waterfront! The glass door lets you see the books inside, and a simple wooden latch keeps the door closed. It even has a pitched roof for those blustery downeast winters! What a great idea – a book swap box in the middle of town! 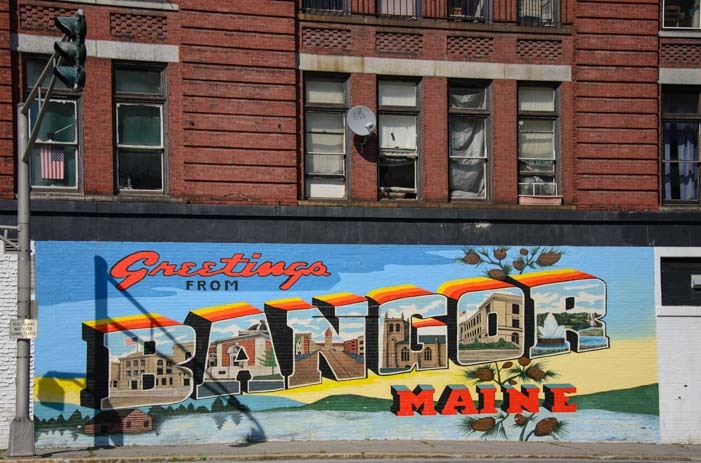 Another Maine treasure that doesn’t get a lot of glitzy promotion from the folks at the Maine visitors centers is Bangor. 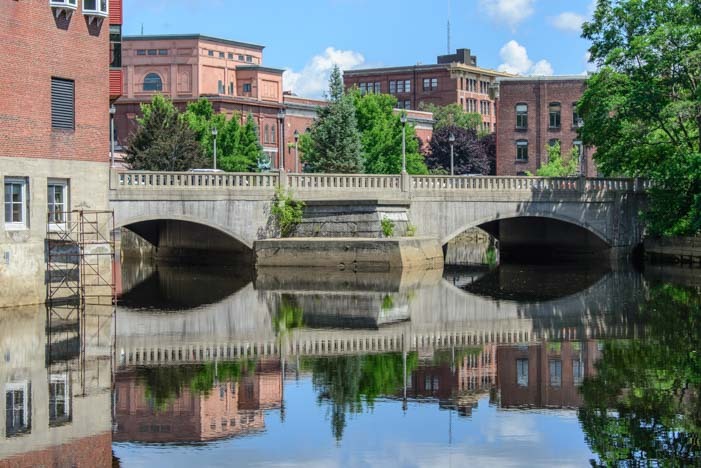 We ended up spending a lot of time in the Bangor area becuase of our trailer axle repair, and we were charmed by the many fun things there are to do. 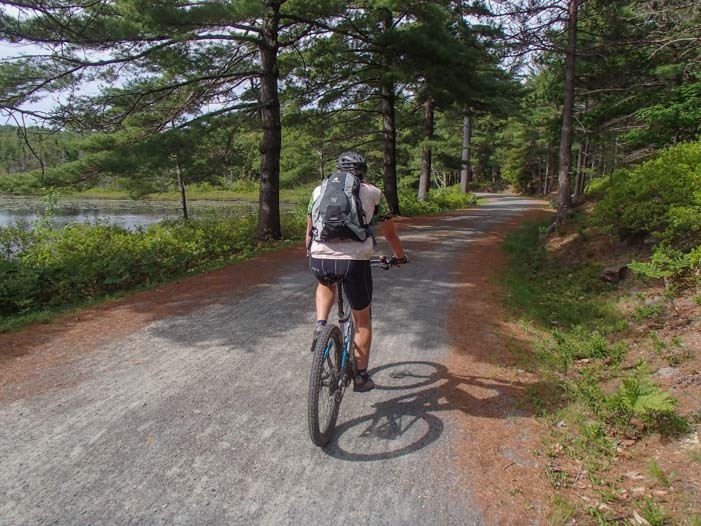 The Kenduskeag Stream Trail runs right from the heart of town by the Sea Dog Brewery out into the hinterlands, taking you past the hustle and bustle of downtown into more rural areas in a fairly short walk. We loved the way the back sides of the city buildings and bridge reflected in the water!! Who knew the back side of Bangor was so pretty?! While we were in Bangor we visited with very special friends who live there, and they took us on a whirlwind tour of some of the highlights in the area. 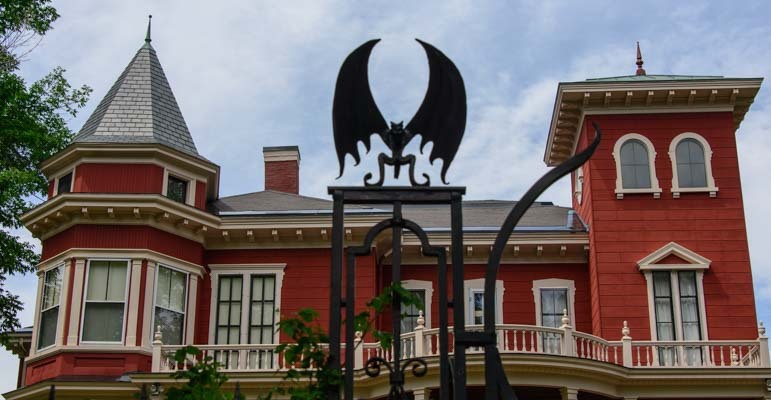 Author Stephen King lives in Bangor, and true to form, his house stands behind beautiful wrought iron fencing that is decorated with gargoyles and bats! 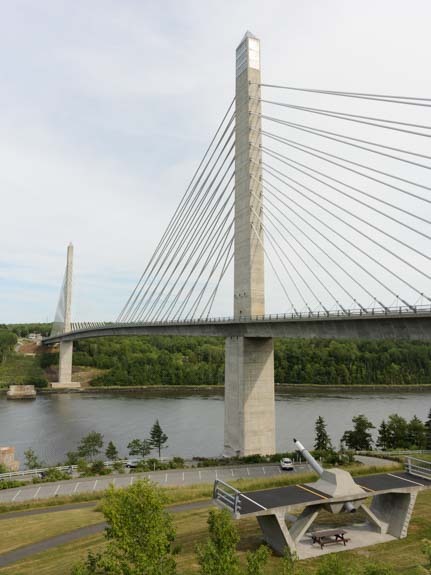 A little south of Bangor is the town of Bucksport which is home to a modern engineering marvel, the Penobscot Narrows Bridge. Opened in 2006, this suspension bridge looks nothing like the classic old 1931 suspension bridge it replaced, a bridge that had also been a major engineering achievement in its time. Standing nearly 450 feet tall, there is an observatory at the top of one of the towers, and we rode the elevator up to have a look around the glass-enclosed observation room. What a view!! Down at the base there is a slice of the bridge that shows exactly how it is constructed — with a picnic table underneath! Of course, visiting friends means downtime too, and Mark got some wonderful photos of our friend Bud’s flower garden. A little north of Bangor we went to the University of Maine – Orono Bog Walk. 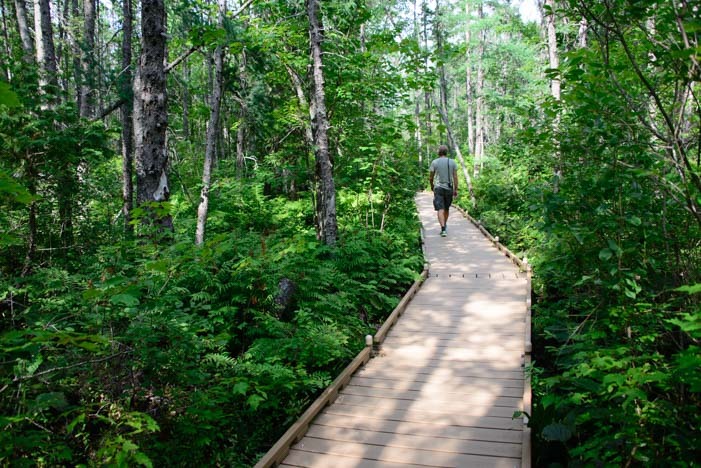 This is a raised wooden platform path that winds all through a natural bog. Starting in thick woods and coming out into the wide open bog, we were intrigued by the peaceful beauty of this place. 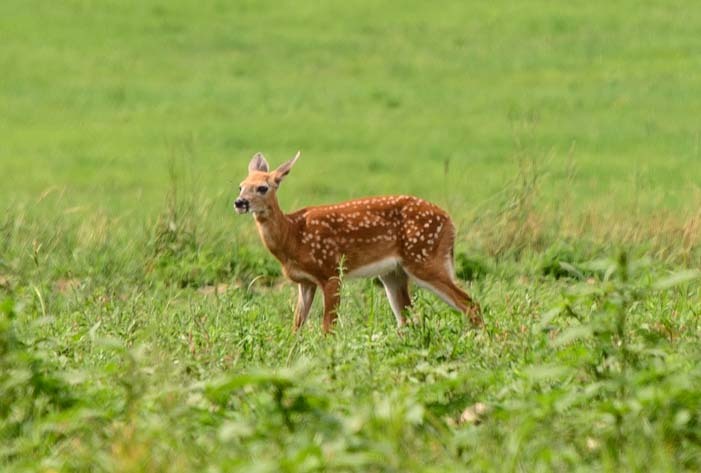 In our wanderings we saw a little spotted fawn in the distance. Then a beautiful little bird with a yellow head started bopping around on a tree branch right in front of me. We later found out this was a black-throated green warbler. 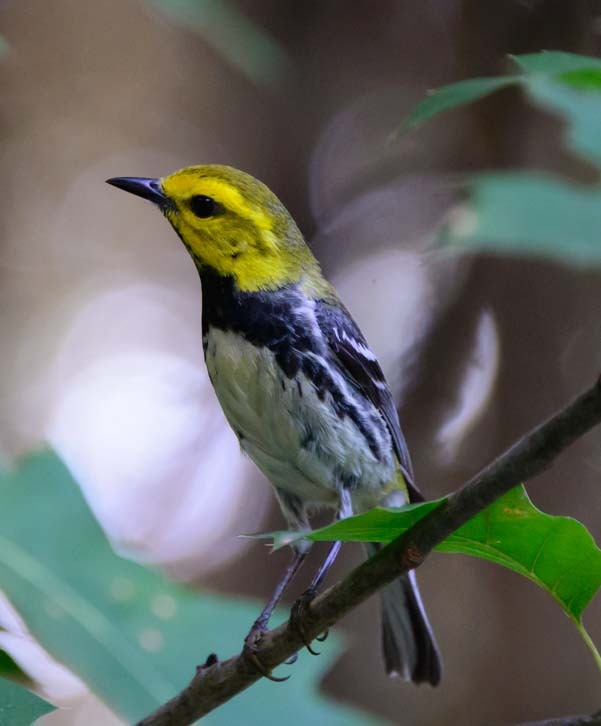 A Black-throated green warbler bounced around right in front of me! Heading up into the heavens for another bird’s eye view of the area, we climbed to the top of the Bangor water tower. 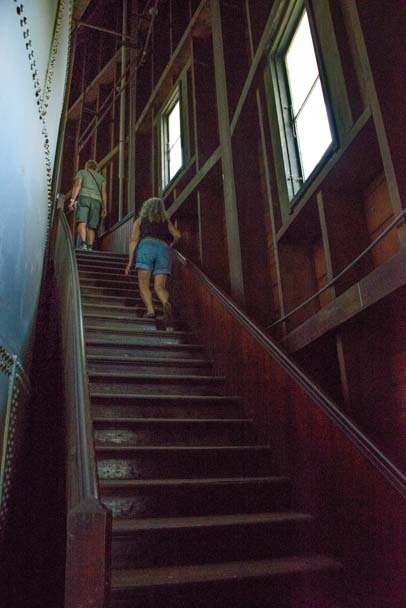 Built in 1897, the Thomas Hill Standpipe is a round wooden tower that encloses a steel tank. Four times a year they open the tower for people to walk up inside and enjoy the open air views at the top. It was neat going up inside this very old water tower, but even more fun was finding the evening news Live at 5 folks at the top rehearsing for their big moment. A guy had a huge camera on his shoulder and the newscaster rehearsed her spiel a few times. We stuck around long enough to get selfies with her, but didn’t see the real taping. 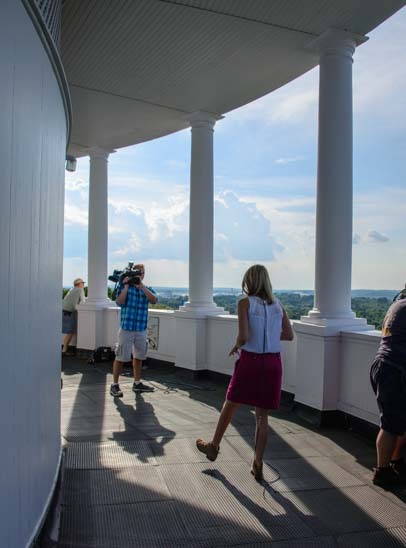 At the top of the water tower the evening news broadcast was as cool as the views! Maine turned out to be quite a highlight in our travels this year, from the wonders of Acadia National Park to the twin international lighthouses way downeast to Rockefeller’s Carriage Roads to the crazy Mail Boat ride to the Cranberry Islands, the misty Maine scenery in fog, and the stunning Schoodic Scenic Drive. 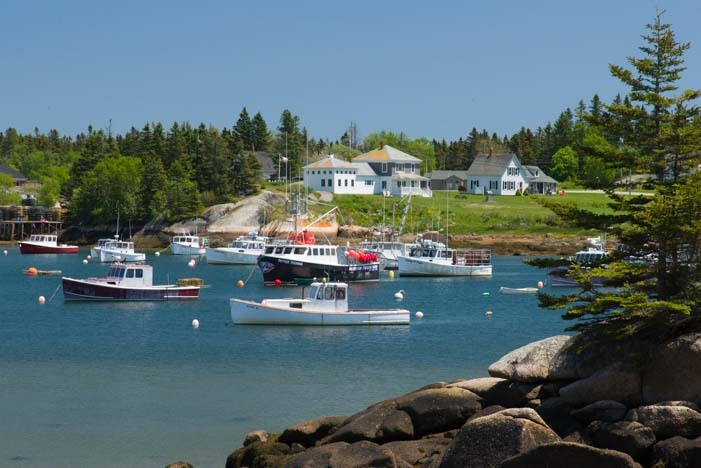 When we came back to Maine with this big trailer repair on our minds, I wasn’t sure we could top the good times we’d had in this pretty state a month prior, but tiny Eastport and the Bangor area proved to be truly delightful. 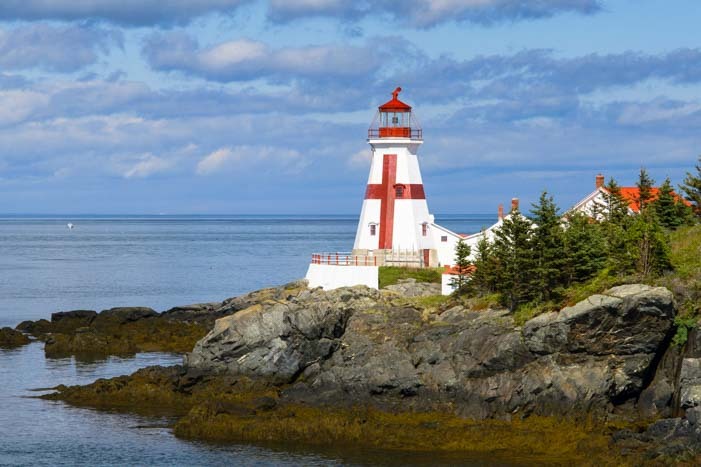 Lubec & Campobello Island – Fantastic Lighthouses! 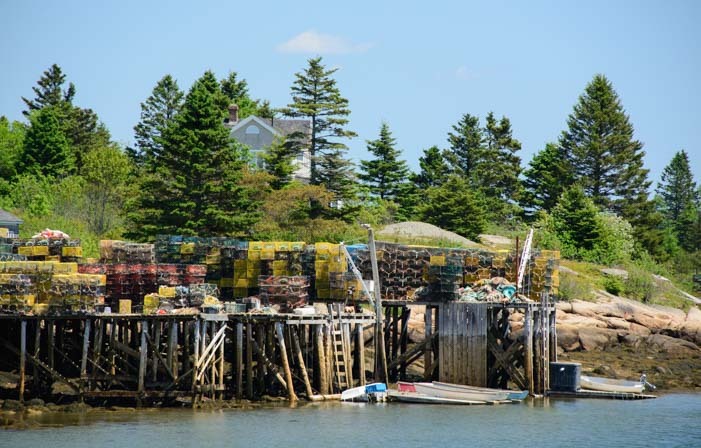 June 2015 – After a really happy visit to Acadia National Park, the nearby Schoodic Peninsula and the crazy mail boat daytrip out to the Cranberry Islands, we headed further downeast to the easternmost point in America: Lubec, Maine. Mainers have a slightly different sense of direction than most, and “Downeast” in these parts actually means “Northeast.” If someone says they went “down” to someplace, it’s best to check a map before assuming they went south. In all likelihood, wherever they went “down to” is north of where they are standing now! The reason for this is simple: the prevailing wind on the Maine coast blows out of the southwest and towards the northeast. So, sailors going “up” the Maine coast to the northeast sail “downwind” to get there! 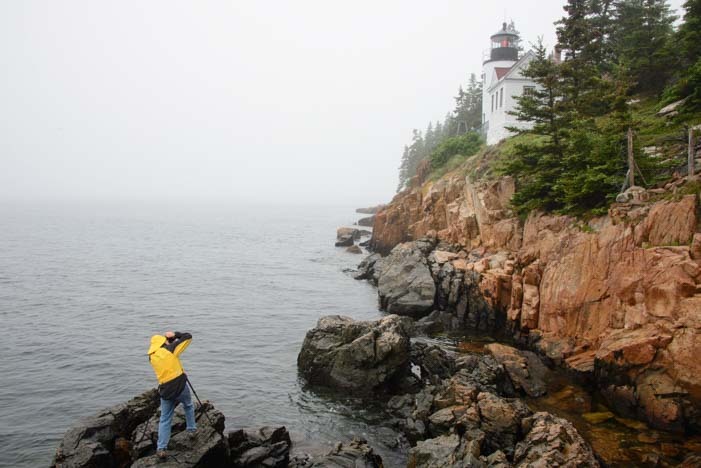 This whole coast is strewn with craggy shores and quaint lighthouses to warn mariners about dangerous rocks, and we had gotten a kick out of seeing the Bass Harbor Head Lighthouse on Mt. Desert Island. But further downeast they get even better! 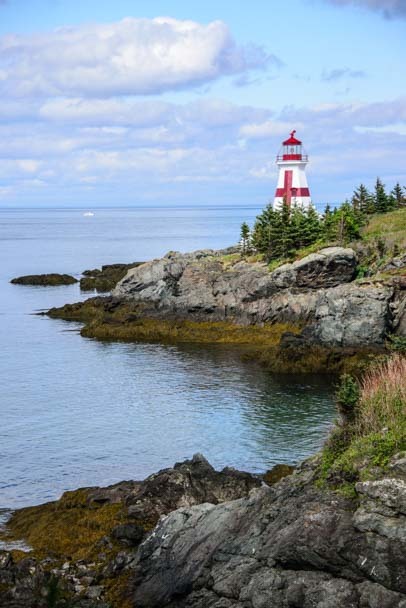 Lubec (“Loobeck”) is home to one of the most striking lighthouses in Maine: the West Quoddy Head Lighthouse. This candy-striped beauty is very accessible, and despite the overcast skies when we were there, we were not alone enjoying a picnic on one of the tables nearby. This fun lighthouse made me think of Pippi Longstocking! 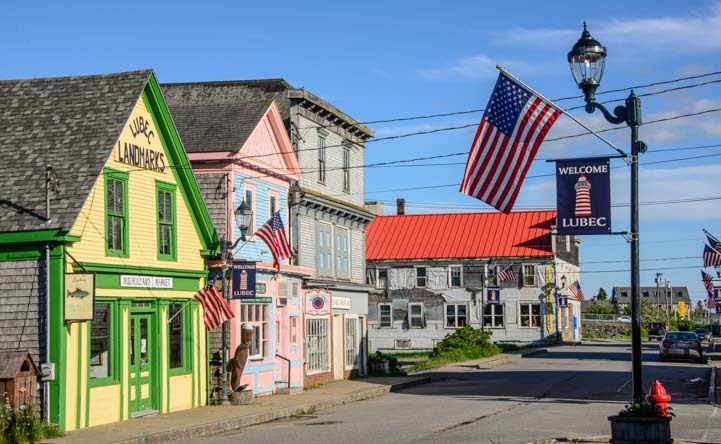 Nearby, the tiny village of Lubec has a cute main street with multi-colored buildings. 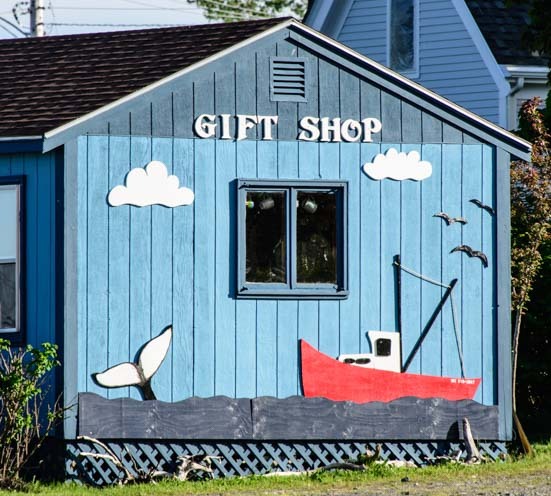 Like all towns on the coast in downeast Maine, lobstering is the way of life here, and lobstering motifs were everywhere, even on the side of a gift shop building. When we walked up one street, we were surprised to see a most unusual motorhome. It was an Airstream 350LE. Airstream is best known for its travel trailers, but how cool it was to see one of their unique motorhomes out on the road! Hey – it’s an Airstream motorhome! 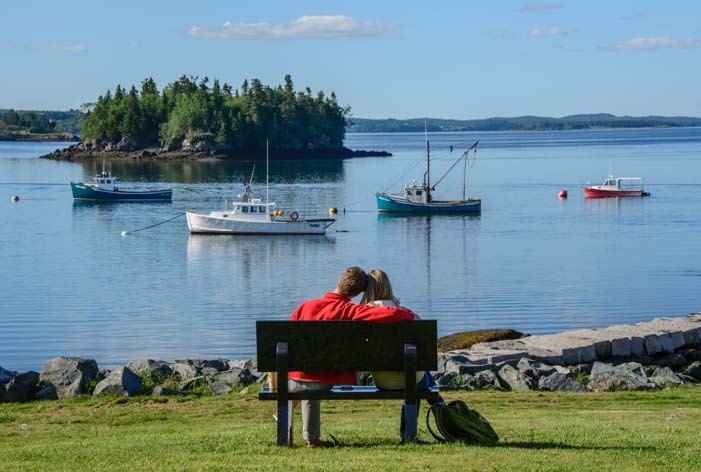 Lubec faces a very pretty harbor, and the benches overlooking the bay can be very romantic! 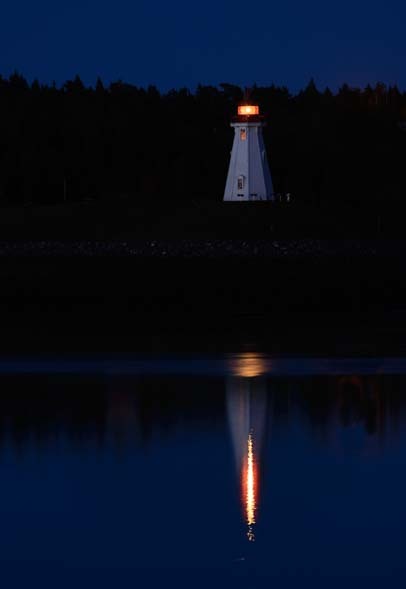 Across the thin strip of water on the other side of the harbor opposite Lubec is Campobello Island which has a lighthouse that shines back towards Lubec. 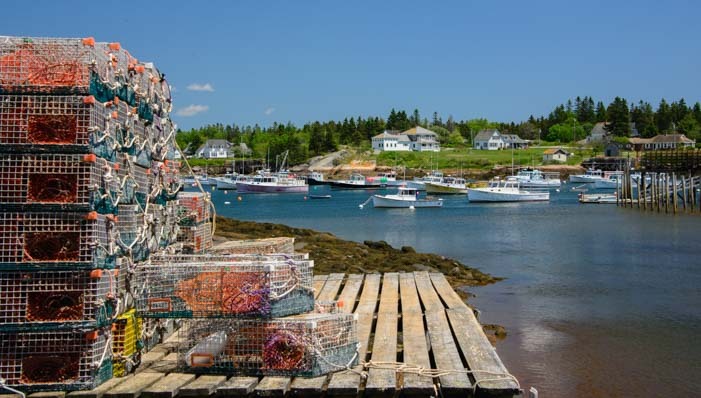 Campobello Island is actually in New Brunswick, Canada, and after admiring the small part of it we could see from Lubec, we decided to take a daytrip to the island. We got up early one morning, dashed down to the docks to see the boats in the early morning light for a moment, and then drove over the bridge that goes onto the island. 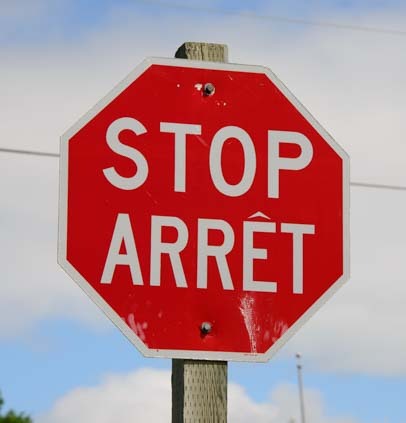 You need a passport to cross into Canada, but other than that it is a super easy border crossing. We were the only ones at the bridge, and in no time we were driving in another country. This was a wonderful little warmup for going into Canada “for real” a few days later when we would cross into the mainland part of New Brunswick at Calais, Maine. But for now, we were just daytripping. Even so, the first sign we saw made us do a double-take! Ahem… we really are in a different country! 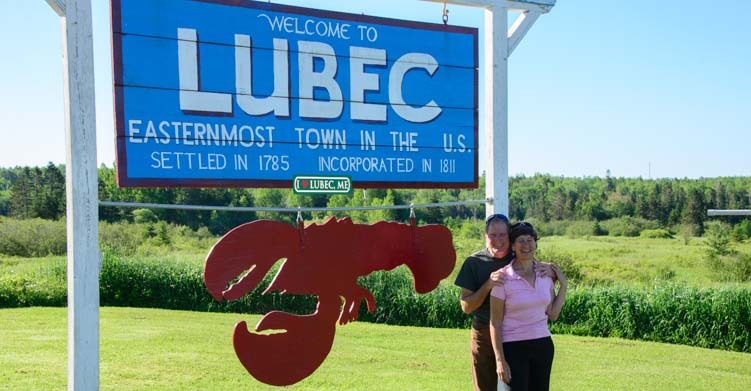 We admired Lubec across the water. It is such a sweet little town! 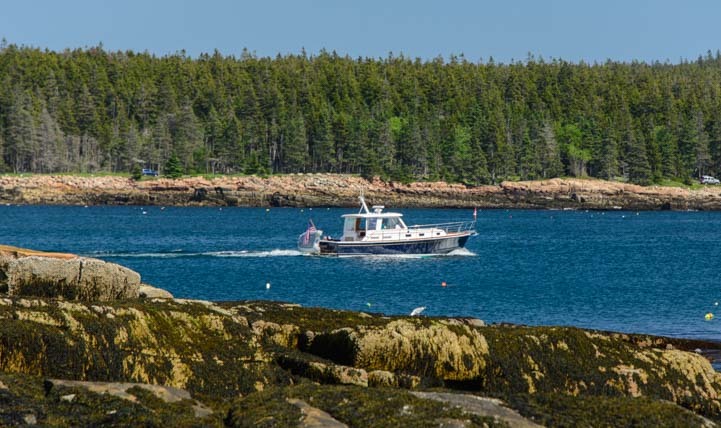 The ocean was like a lake in the early morning sun, and we watched the lobster boats out doing their rounds to all their traps. 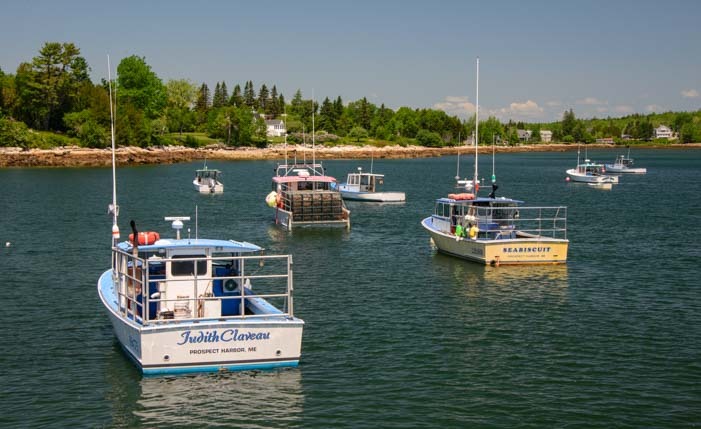 Lobstering is a way of life on both sides of the border. As we drove to the far end of the island, we marveled at the pristine forest and ultra clear water. We could see every detail of the seaweed waving under the surface. The woods and water seemed virgin here. We climbed down a steep path towards the water and I spotted a sea urchin shell in the grass. 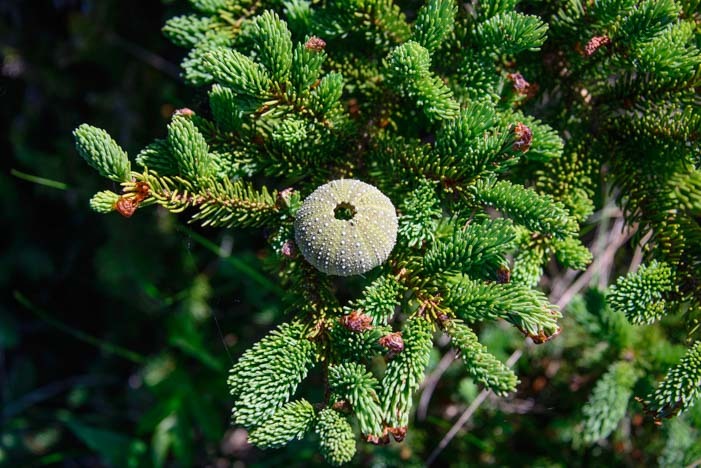 I don’t know how it got up there, but I put it on an evergreen tree branch between the pine cones. What a neat contrast — the woods meeting the sea. 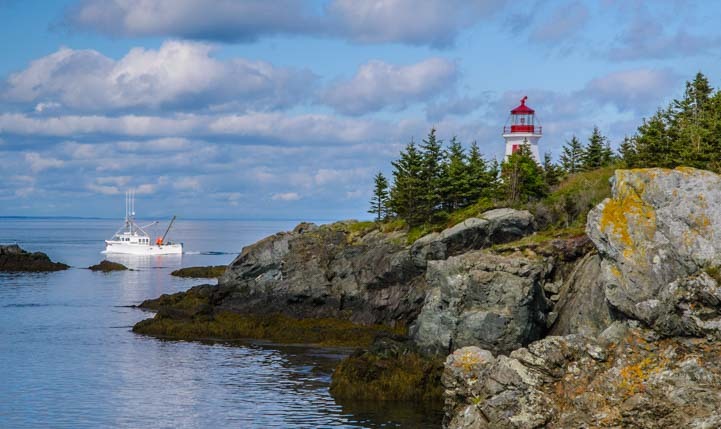 Campobello Island’s sister lighthouse to the West Quoddy Head Lighthouse in Lubec is the East Quoddy Head Lighthouse! 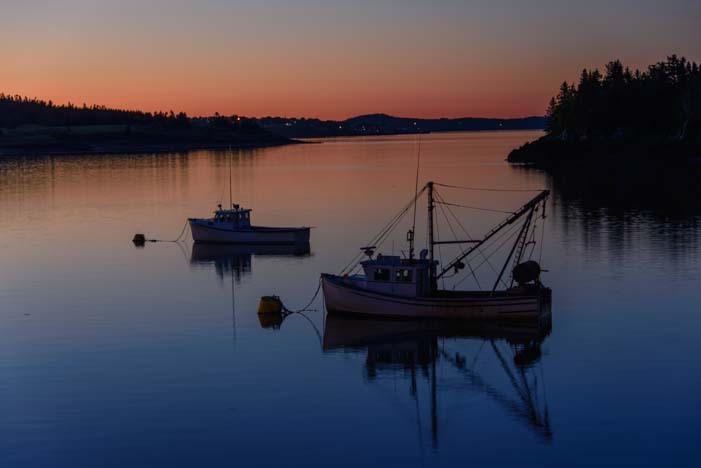 It sits at the far north end of Campobello Island, and it is equally stunning. It peeked out at us from behind the trees at first, but we found a woodsy trail that goes out a ways on a small peninsula where we were able to see it in its full glory. 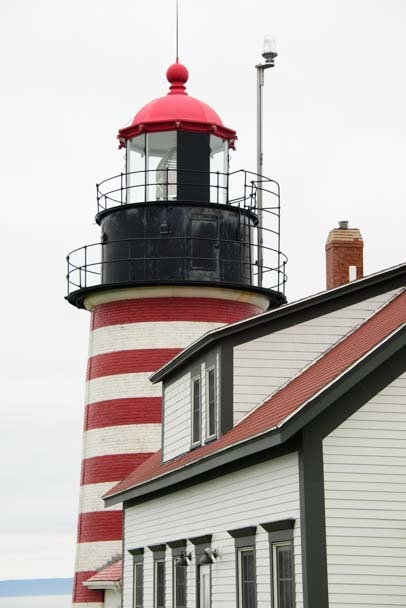 Rather than being candy-striped, this lighthouse has a huge red cross on its front. You can walk out to this lighthouse to see all its outbuildings up close for two hours before and after every low tide. 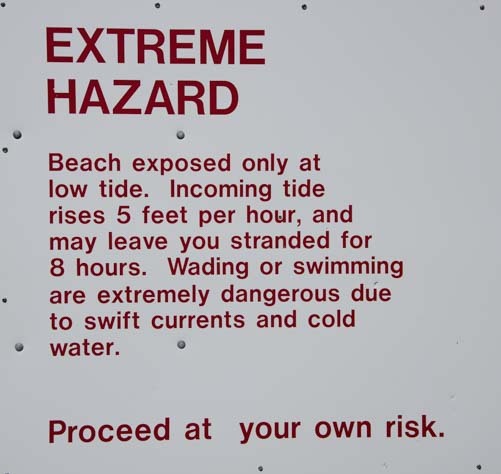 The tides are immense here, however, and the water moves really quickly. So, you have to time your visit to the lighthouse very carefully!! The tides are gargantuan here. At low tide you can walk to the lighthouse — if you dare! It would be another few hours before the tide’s window of opportunity opened up for us, so we contented ourselves with getting pics of this beautiful lighthouse from across the water. What a stunner! 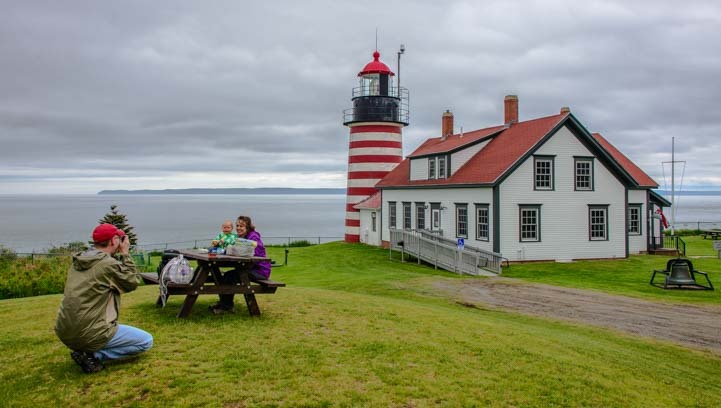 East Quoddy Lighthouse — very regal! 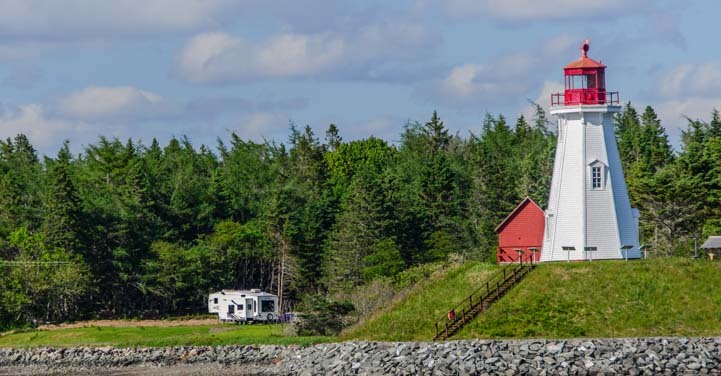 This little one-day introduction to Canada’s east coast was a really great appetizer for us and got us in the mood to do some more exploring north of the border. 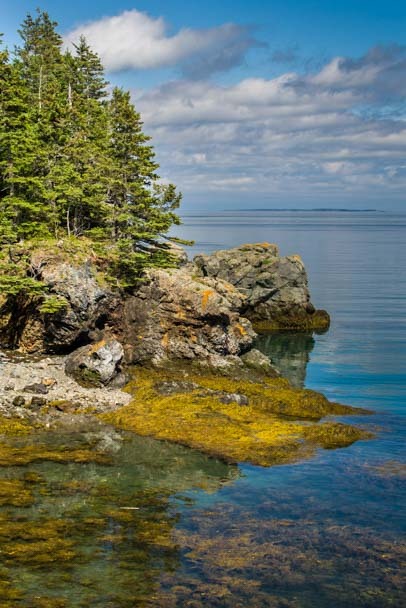 June 2015 – So far our travels in downeast Maine and Acadia National Park had far exceeded our expectations. The sights, the smells, the cute towns and the beautiful coast had all been intoxicating, and we were sure it couldn’t get any better. But it did! 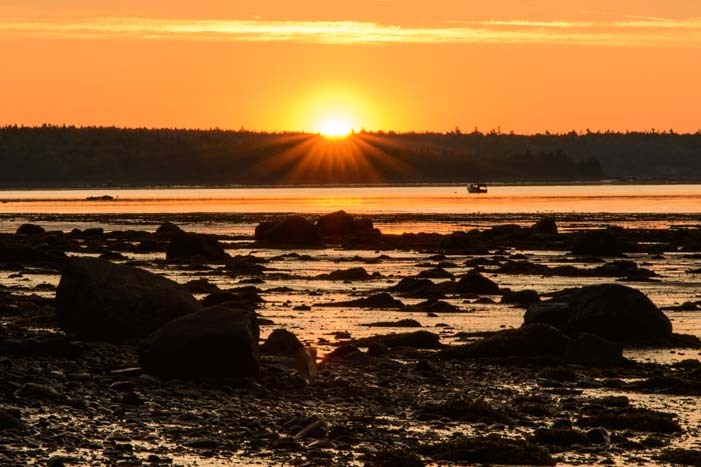 The Maine coast at dawn – magical! 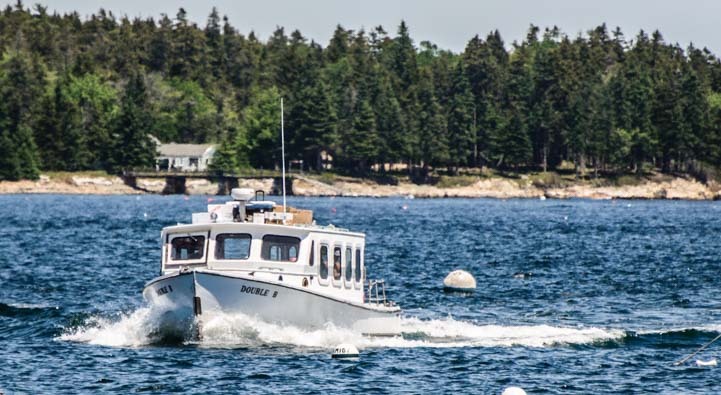 The best way to see the northern Maine coast is by boat, and I had been scouting around for ways to get us out on the water. The colorful sailboats looked so inviting in the early morning light. 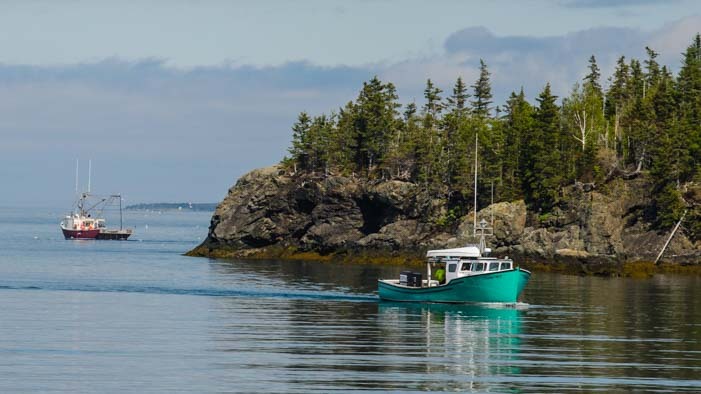 The water beckoned, and I wanted so much for Mark to experience Maine from the water on a boat, because it is nothing at all like Mexico or the west coast where we had done all our sailing together. There are all sorts of tourist boat rides available, from whale watching tours to schooner rides to cruises. But when I saw that the local mail boat takes passengers to two of the tiny islands just off Mt. Desert Island, I knew I’d found just the thing. This mail boat is exactly that, a small boat that delivers the mail to the folks who live on nearby Cranberry and Islesford islands. It also picks up and delivers all kinds of other things too, including people. We hopped aboard with a small rag-tag group of people in the early morning and stood in the back watching the shore disappear. Once the boat got a ways from shore, Ted, the ticket man, whipped out a smartphone and ran our credit card for our tickets. “I can’t get a signal on shore, but I can get one out here,” he said, handing us back our card. How funny! We passed some beautiful sailing yachts bobbing on their moorings and we passed some lobster boats as well. The wind felt fresh in my hair and cold on my cheeks. Ted told us how this ferry, the Double B, runs every day of the year. 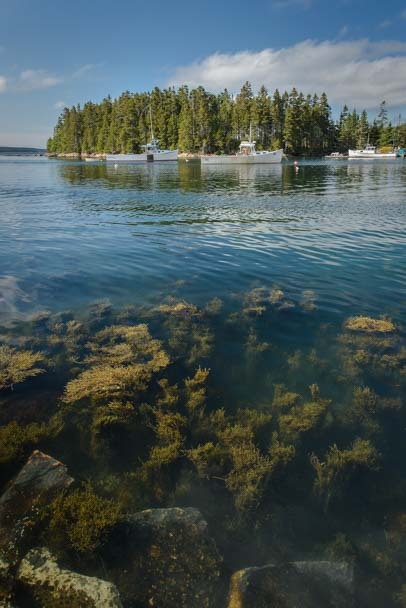 In many ways it is a lifeline between the people on these two small islands and the rest of Maine. 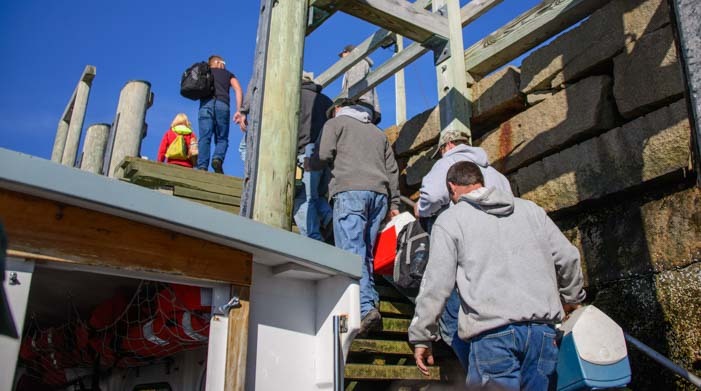 I hadn’t really noticed that we were surrounded by men on the boat who were carrying lunch pails, but when we got to our first stop, Cranberry Island, everyone around me suddenly piled off the boat and up the steep stairs onto the dock. Every single one was a fellow heading to work with a lunch box. How cool is that! No sooner had they all gone up the stairs than a group of schoolkids came down the stairs! Everyone on the mail boat knew each other, and the adults on the boat welcomed the kids eagerly. Each child had a backpack and was dressed for school — and each was wearing a lifejacket too. Ted and the other adults checked that all the kids they expected to see were aboard, and then the schoolbus / mail boat headed back out to sea. These kids live on Cranberry Island but go to school on the island of Islesford! 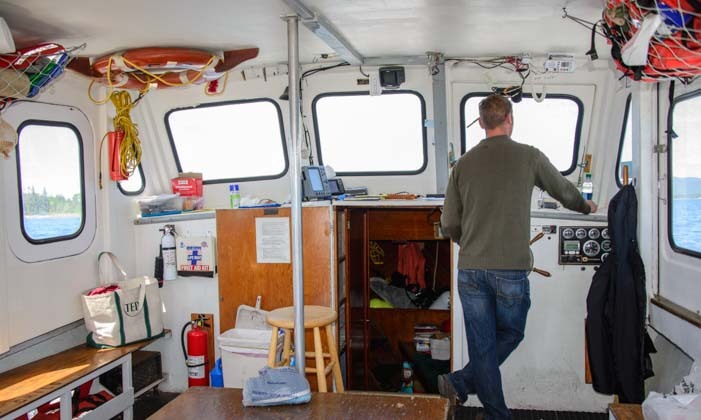 Ted explained that no matter what the conditions, the “Double B” mail boat ferry runs — unless it is just too dangerous. This past winter was a doozy, and he described one day where the ocean spray was huge as the boat pounded through the surf, and the water froze in mid air. It built up on the boat’s windows so fast that the captain couldn’t see a thing and had to turn around. 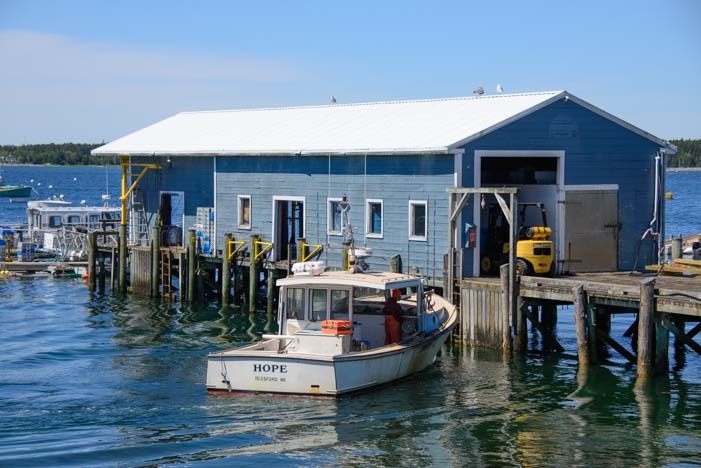 But this boat is a vital link for these islands, and when we landed in Islesford, we were amazed to see a brand new washing machine on the dock waiting to be loaded onto the mail boat. We weren’t sure why a brand new washing machine would be leaving the island instead of arriving, but maybe it had to be returned! How do these folks do their shopping, I asked a local woman on the dock. “We live and die by Amazon,” she joked. 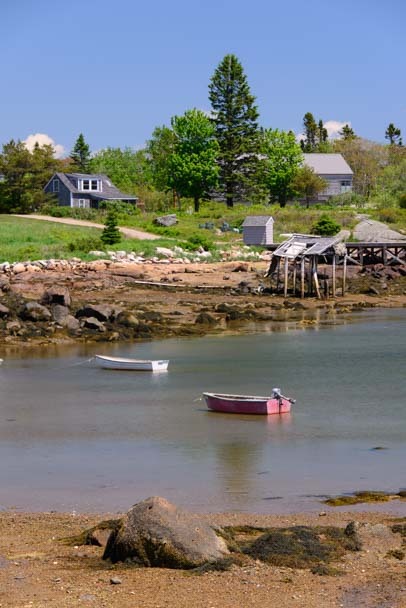 Islesford is a tiny island with just a handful of inhabitants. 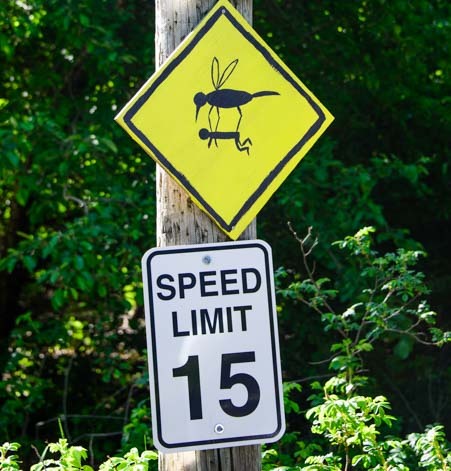 As we walked up off the docks, we were greeted with a sign that made two things clear: 1) The mosquitos are so fierce that they carry people away, and 2) the speed limit for cars on the island is 15 mph! if the mosquitos don’t carry you away! This is a very quiet island, and after the school kids and their teachers had disappeared from view, we wandered around the docks and then up the street a bit. 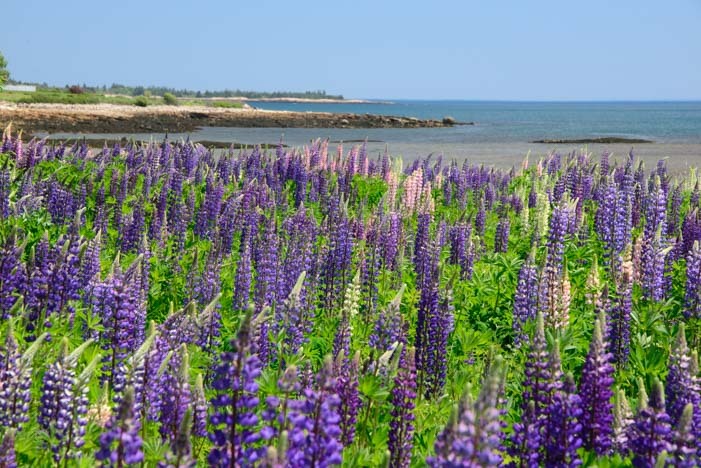 Islesford is a jewel of an island. There isn’t really a town center, but we passed the tiny Islesford post office and Islesford Market, which share a small store front. Then we came across a welcoming building that had a sign over the door, “Neighborhood House.” There were picnic tables out front, and since we’d gotten an early start to the day, and our tummies were rumbling, and neither of our moms was around to say we had to wait, we sat down and ate our picnic lunch despite it being barely 10:00 a.m. This village has a Neighborhood House — neat! 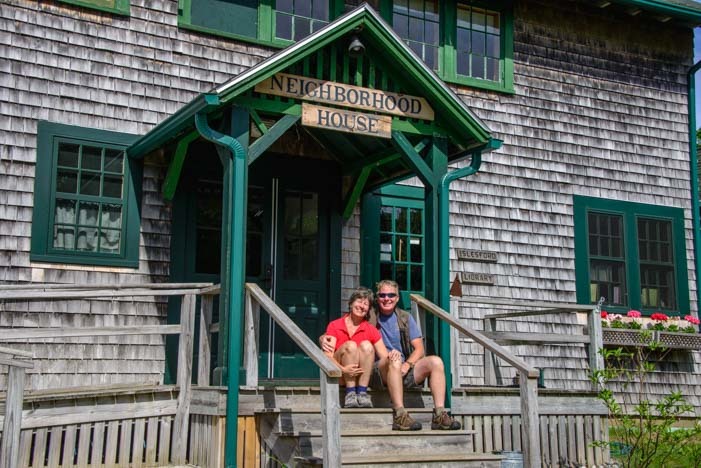 We continued our stroll after lunch and found ourselves in front of a sign that said, “Islesford Artists.” This was a gallery dedicated to artists from the island, and the the curator, Katy Morse Fernald, showed us some beautiful paintings. 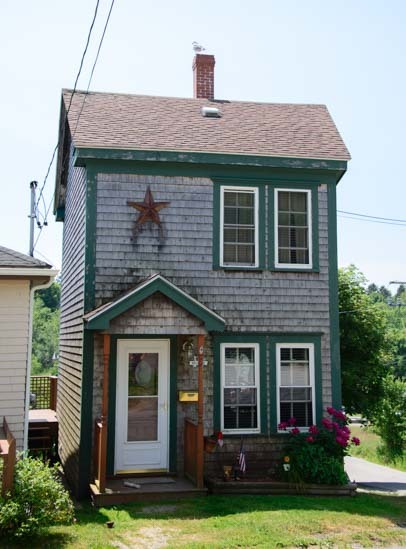 Upstairs there was a loft room that once housed her husband’s lobster traps and line and buoys. 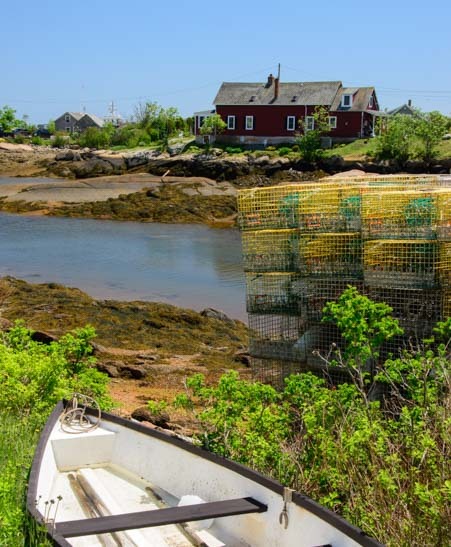 He was a sixth generation lobsterman from the area! 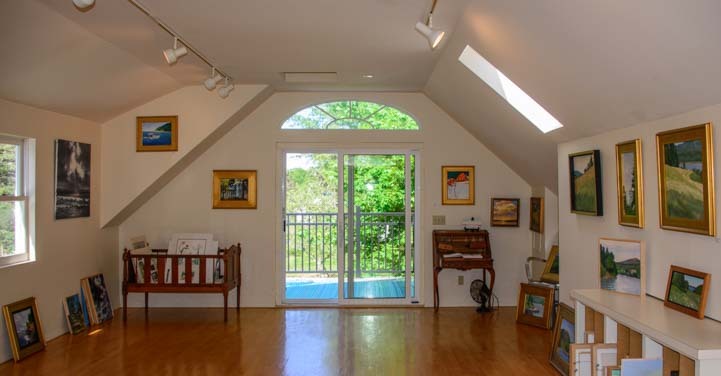 The upstairs gallery room at Islesford Artists used to be storage for lobster traps and bouys. We got chatting with her about the lobster industry, and we were very surprised when she said it is currently fluorishing in Maine. 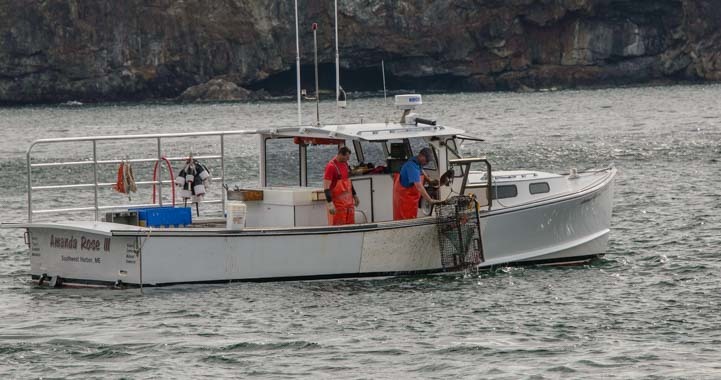 She attributes this primarily to the overfishing of the predator fish as well as to the increase in the minimum sizes for lobsters so they are a little older when they’re caught and have had a chance to reproduce more. I hadn’t realized that lobsters have predators. I guess I just never imagined a large fish chomping away on a crunchy lobster, shell and all! After a few hours on Islesford, the mail boat came back on its rounds and we caught a ride to Cranberry Island. The mail boat goes round and round between Mt. 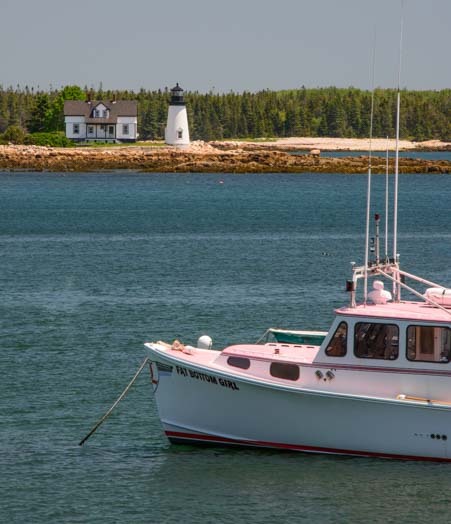 Desert Island, Islesford and Cranberry Island all day long, and a passenger ticket is good for as many rides between the destinations in one day as you wish to take! Cranberry Island (“Great” Cranberry) is a little bit bigger than Islesford (“Little Cranberry”), but not much. The Cranberry General Store was at the top of the dock and had a restaurant where people were having lunch. 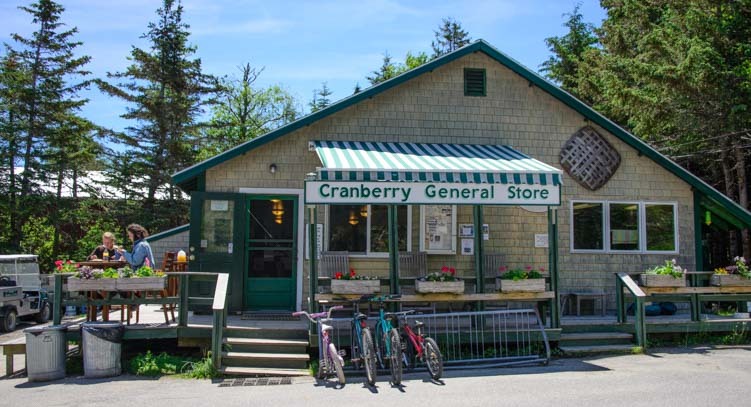 Cranberry Island General Store — just a bit bigger than the one on Islesford! 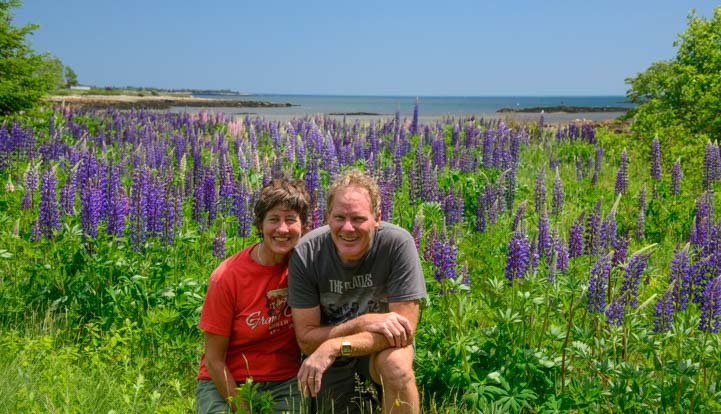 Walking the quiet roads on Cranberry Island, we passed several pretty homes and quite a few stands of purple lupine wildflowers. 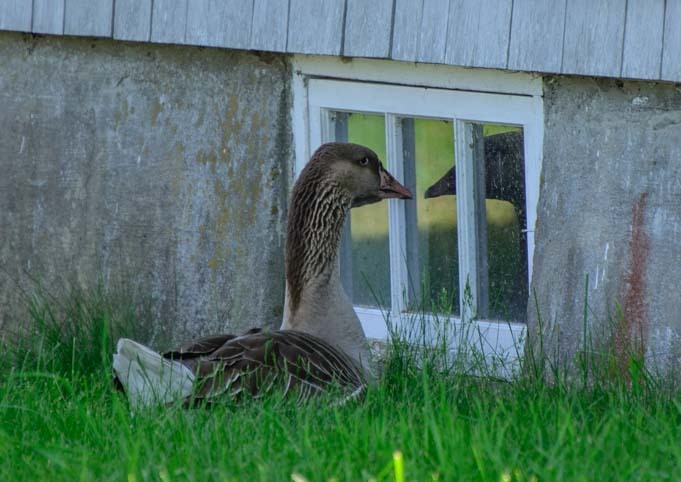 At one house there was a goose who was very enamored with her own reflection in a basement window!! Back at the town dock, we walked for a little ways along a pebble beach that was lined with washed up seaweed. 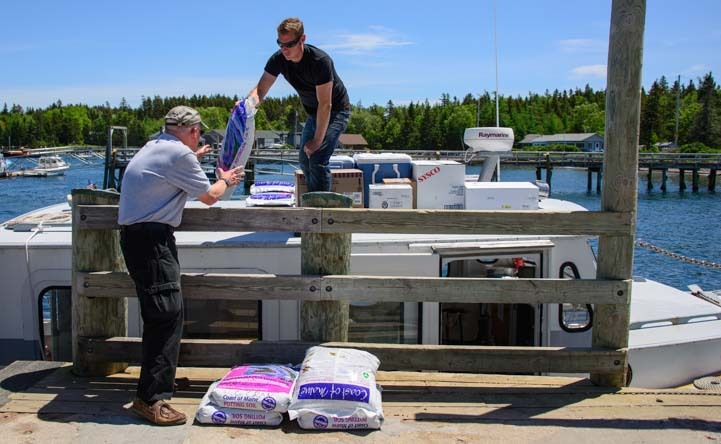 The mail boat had returned to Cranberry Island by now, and we watched Ted and the captain unloading their deliveries from the roof of the boat. Coolers full of fresh food were destined for Hitty’s Cafe, a popular restaurant that is a few streets back from the town dock. There were also quite a few bags of potting soil and a lot of boxes destined for the post office. A pickup truck was there to pick up a lot of the goodies, and it had a stack of US Mail sorting bins that were headed back to Mt. Desert Island. It was quite an operation, and one that goes on all day long everyday, year in and year out, as small goods and packages get moved between the islands of Mt. Desert, Islesford and Great Cranberry. We watched a larger commercial boat delivering a big heavy construction vehicle onto another dock. 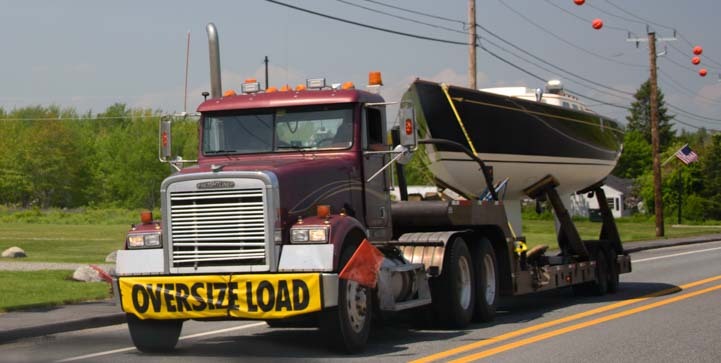 The “Double B” is too small to carry vehicles, but it seems that vehicles are delivered one at a time here! Soon it was our turn to climb aboard. We stood to the back watching other people come onto the boat, and we recognized some of the people we had seen in the morning. Then, we looked up and noticed a guy with a long beard walking down the dock carrying a big drum. Next to him was a young boy with an equally big drum. They set them down in the boat and then disappeared. Then some more people came with similar drums and then more and more. Soon there was a huge stack of these drums right in front of us on the boat! The stack kept growing! At long last the boat was loaded, drums stacked high, and then a fellow in a blue shirt jumped in. It turned out it was Beau Lisy, the school music teacher on Islesford, and he had just finished teaching the kids a segment on west African music. He lived on Mt. Desert Island and commuted via this mail boat out to Islesford School once a week to teach music to all the kids. 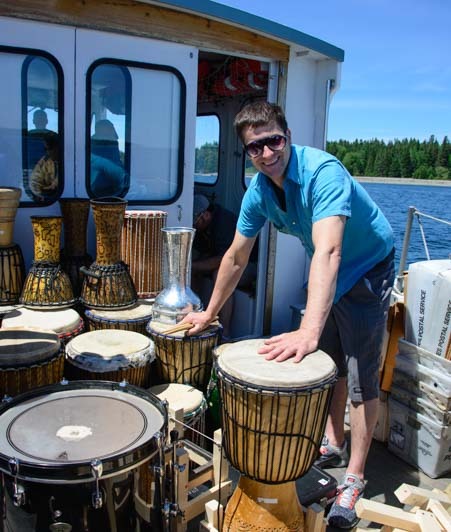 Of all crazy things — the boat gets loaded up with African bongo drums! Beau was a professional musician, and he performed in Northeast Harbor and in other venues in the Mt. 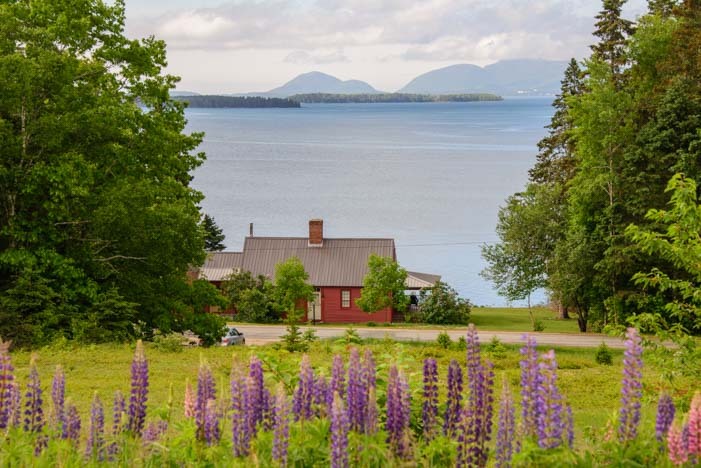 Desert Island area in Maine in addition to giving private music lessons and teaching music at this little island school. He was a super guy to talk to, and as he described bringing out professional music friends of his to introduce the kids to various styles of music — a classical music trio and rock musicians and west African drummers and more — how cool for these island kids! 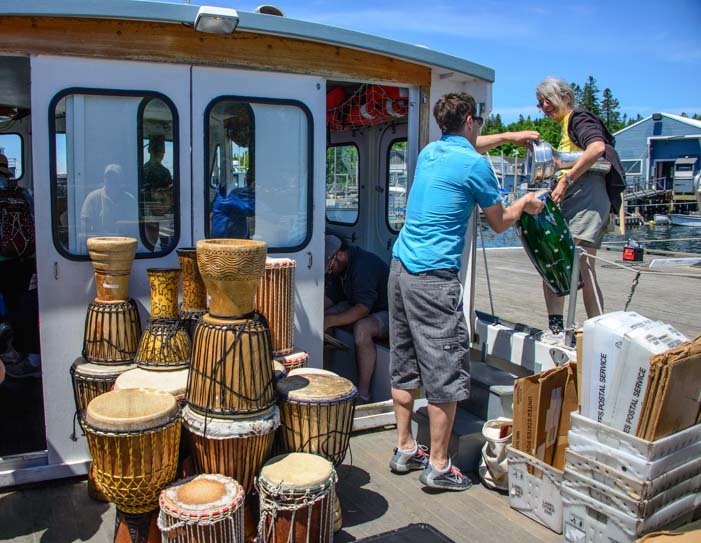 The funny thing is that all of Beau’s musician friends had to carry their instruments on the mail boat too, even in January!! This wonderful excursion on the Double B mail boat was a true highlight in our visit to Mt. Desert Island. If you travel to Mt. 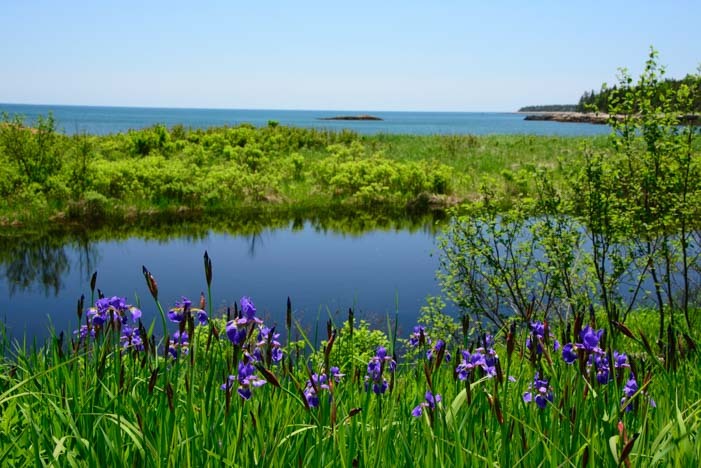 Desert, whether by RV or by other means, plan a day trip out to the Cranberry Islands via the mail boat. You’ll be traveling the way the locals do, right alongside the mail, the small packages, the food coolers, and maybe even the bongos too! The Cranberry Islands were lovely, but the mail boat rides were the highlight of the day! The Double B mailboat sails out of Northeast Harbor. Our tickets were $32 apiece for one day of unlimited rides between the islands. Each leg is roughly 15 to 30 minutes. Before getting off at each stop, check with Ted or the captain for the times for the next ferry. They don’t always go around in a circle but double back once or twice during the day between Islesford and Cranberry Island. You can take bicycles for an additional small fee, and we watched two French Canadians loading and unloading their bikes on one leg of our trip — easy! However, we found that the islands were small enough to get a flavor of each one on foot. One other tip — dress in layers, as it can be chilly out on the water and quite warm as you walk around inland in the sunshine. 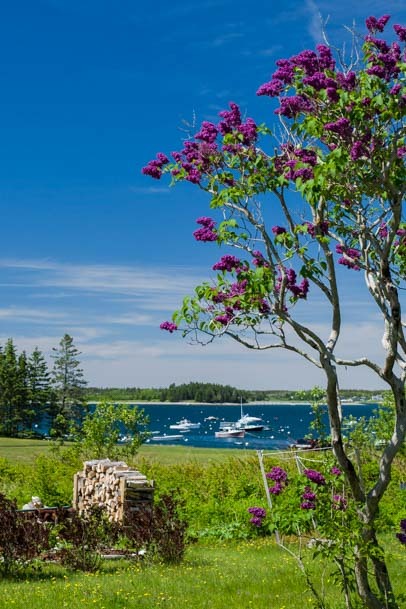 There are places to get lunch on Cranberry Island. June 2015 – There’s an old saying in New England that if you don’t like the weather, just wait a minute. Well, so it was for us during our RV travels in northern Maine. 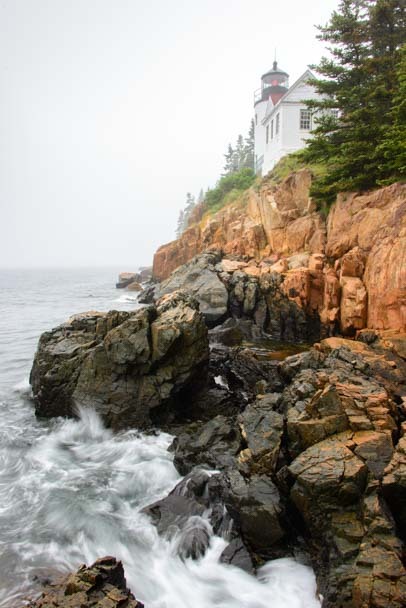 For the most part, we were blessed with wonderfully sunny and warm weather as we explored Acadia National Park and its Carriage Roads, but we woke up one morning to total fog and drippiness. Luckily, coastal Maine is one of those places that has its own special beauty when the sky is grey. There’s a mysteriousness to the fog that sweeps across the harbors. We had enjoyed the Schoodic scenic drive east of Mt. Desert Island so much that we decided to take a drive down the western lobe of the island to check out Southwest Harbor and Bass Harbor, despite the wet weather. 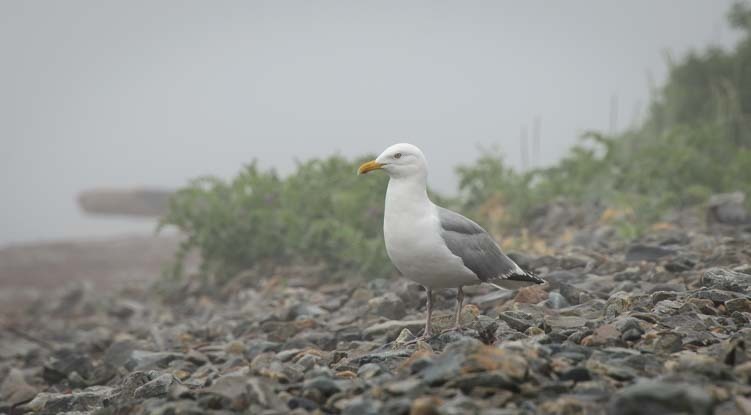 The fog was thick, but the seagulls didn’t mind. 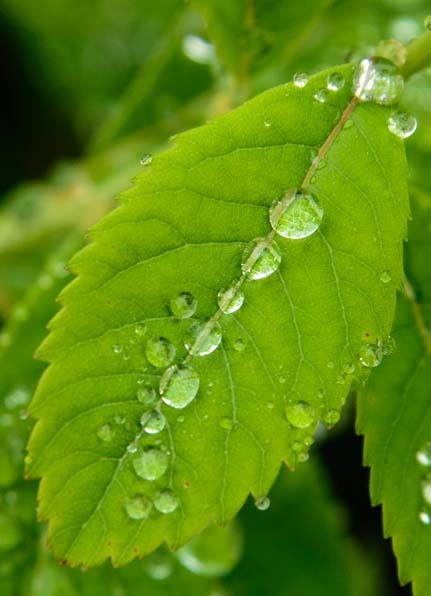 This guy’s no stranger to drippy weather! Lovely Bass Harbor Head Lighthouse is featured on lots of Maine tourist literature and calendars, and we scrambled out on the rocks to have a look at it. The granite boulders were fairly slick in the drizzling rain, but there were still quite a few people out lighthouse-peeping along with us. 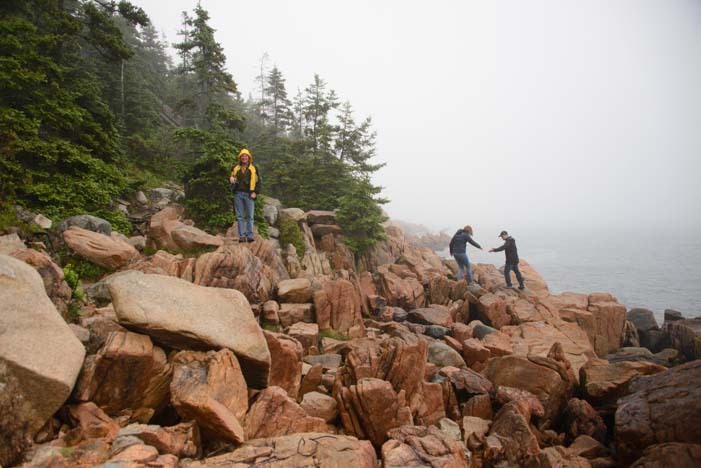 Scrambling around the rocks at Bass Harbor Head Light. We had to climb out on the rocks pretty far to get a good view of the lighthouse, but it was well worth the slipping and sliding! Mark was totally in his element taking photos in front of me, and he was very cute in his yellow fisherman’s hat. Funny thing is that we bought two of those hats for our cruise in Mexico but had occasion to wear them only once for about 10 minutes! It just doesn’t rain very often in Pacific Mexico. However, since we’ve been RVing in the east, they have come in very handy and we’ve worn them quite a few times! Even though it was drizzling our cameras didn’t stop! The short trail that goes out to the Bass Harbor Lighthouse meanders through the woods, and on our way back we got waylaid by the prettiness of this little bit of forest. 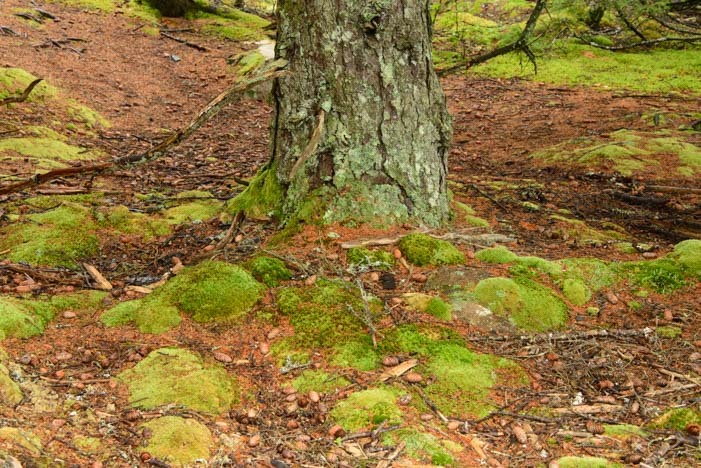 I just loved the thick carpet of soft moss that surrounded some of the trees. We found wonderfully soft and velvety moss along the trail to the lighthous. 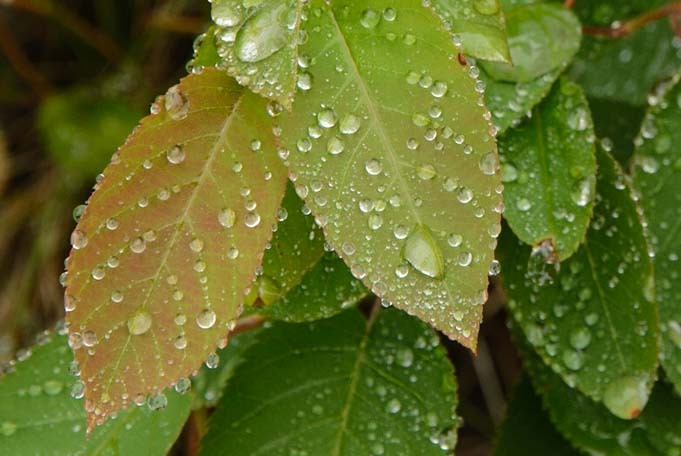 Raindrops covered all the leaves on every bush, and each leaf looked like it was covered with glistening jewels. All the leaves were decked out in their finest jewelry. 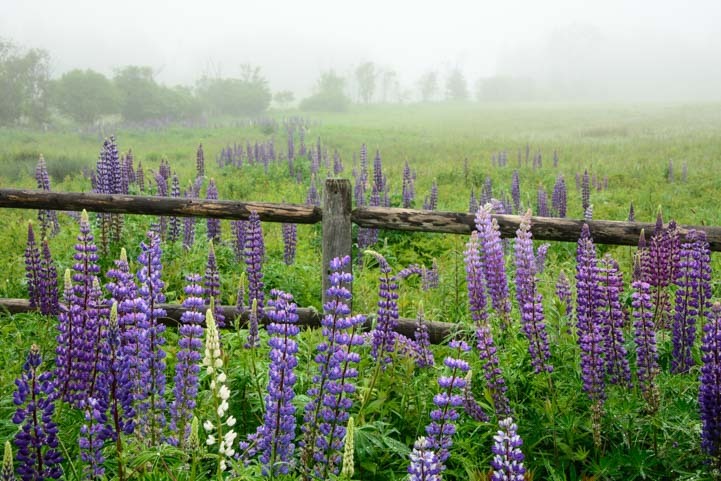 The fog lay heavy on everything, and as we wandered back into Bass Harbor, a soft haze hovered over the fields of wild lupine flowers. 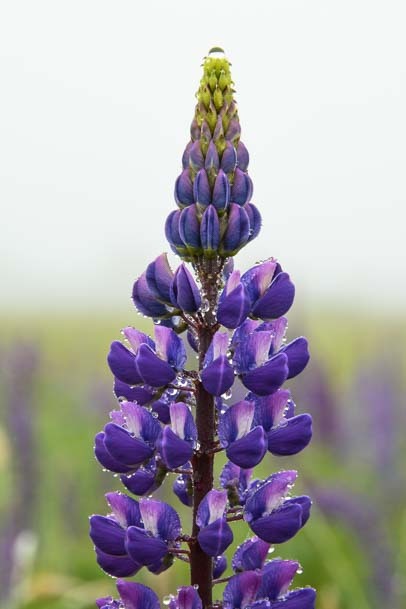 The wild lupine looked lovely in the mist. We stopped to enjoy the misty beauty, and when we looked at the purple flowers up close, we saw that each one was filled with tiny diamonds! 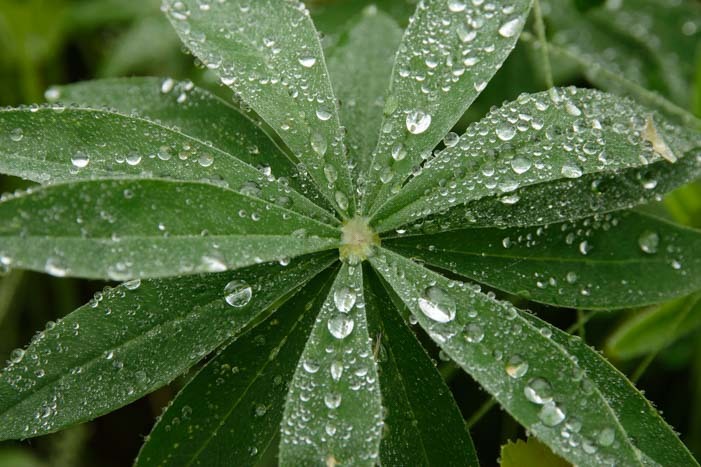 Glittering diamonds on a wild lupine – even on top! There wasn’t a lot of action on the waterfront. It just wasn’t a day that encouraged people to play outdoors. But there was a peacefulness in the air. The fog got so thick at times that everything in the distance disappeared. 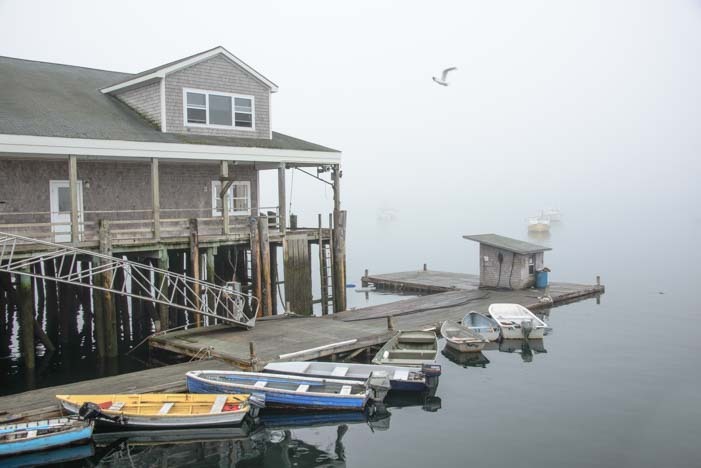 This is another side of Maine — cold and damp…and a little bit dreamy too. Things were very quiet on the docks. 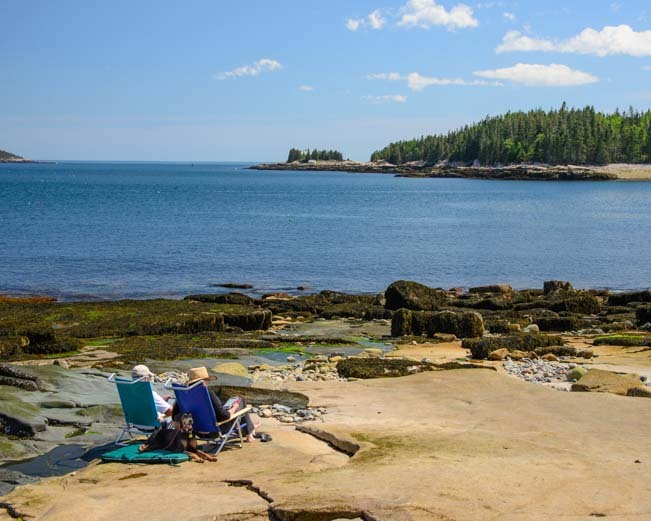 When you go RVing in Maine and get a day of bad weather, spend a little time on the shore and experience Maine’s mystical side…! 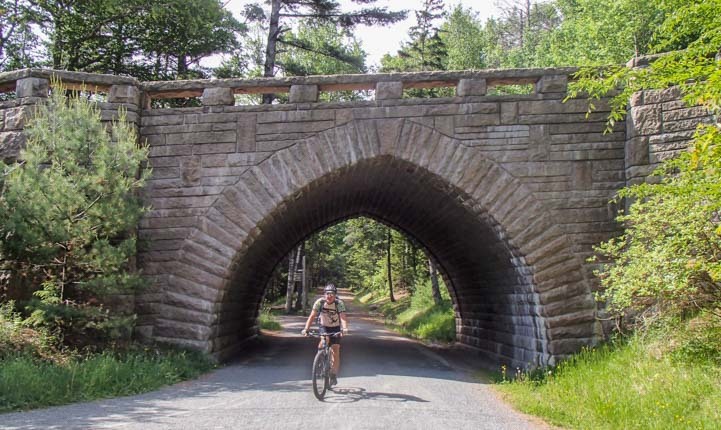 Acadia National Park’s Carriage Roads in Maine – Thanks, Rockefeller! 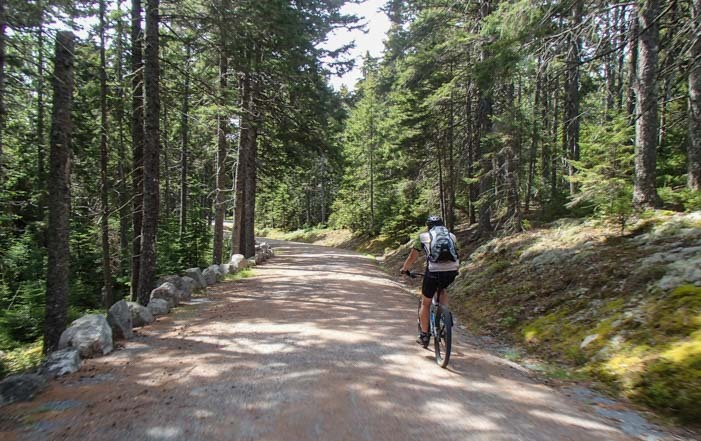 June 2015 – One of the great treasures of Acadia National Park is the Carriage Road system. 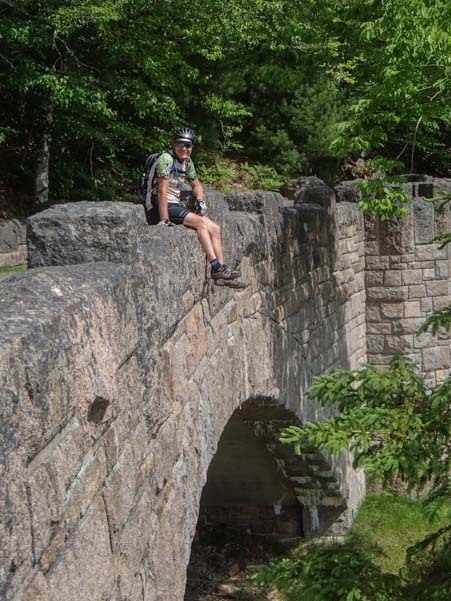 These roads, which are open only to non-motorized traffic, run all through the interior of the park for a total of nearly 50 miles, traveling through the woods, passing by lakes and ponds, and skipping over streams on beautiful old stone bridges. 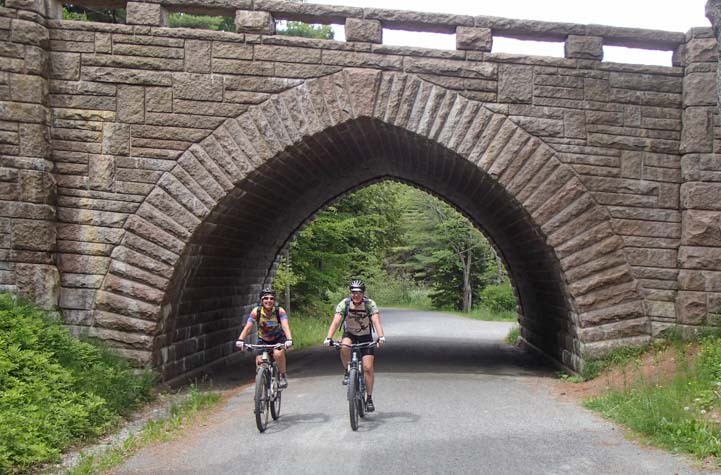 We loved taking our bikes out on these roads during our RV travels to Maine. While we were there, we discovered that, like many of America’s national parks, we have the Rockefeller family to thank for this unusual road system. 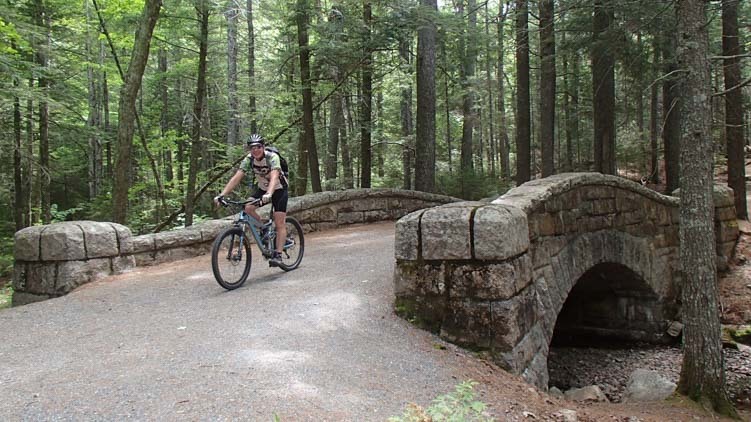 It turns out that the history behind the Carriage Roads is quite a tale. 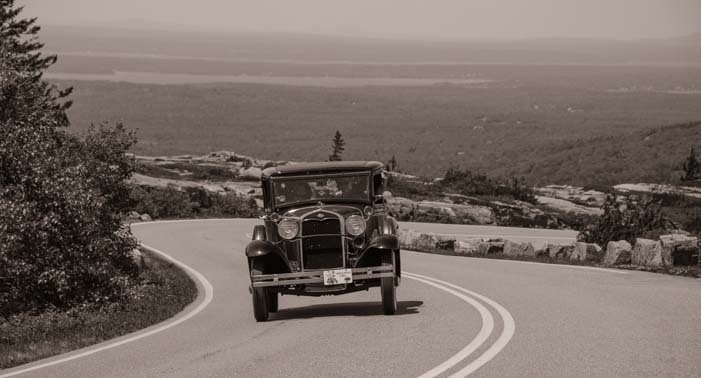 Back at the turn of the 20th century when cars were first coming into use, the folks that lived on Maine’s Mt. Desert Island had a bit of a class war over whether or not automobiles would be allowed on the island’s roads. The wealthy people who owned the summer estates (Pulitzers, Vanderbilts and others of their ilk) wanted Mt. Desert Island to be a rural getaway where they could travel about by horse and carriage and leave the hustle and bustle of the city and its newfangled automobiles behind. 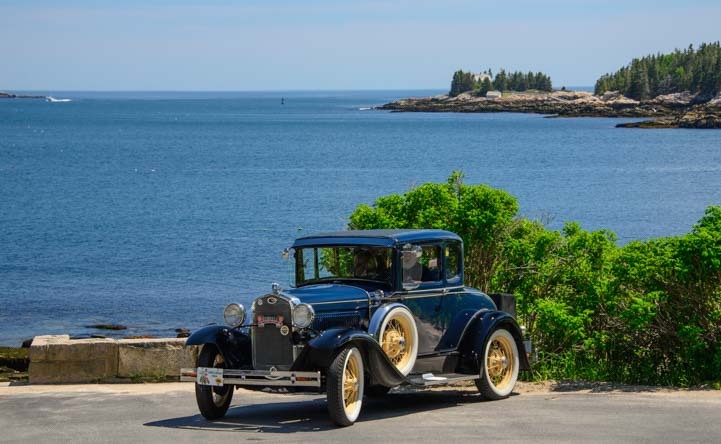 The locals who called the island home all year long wanted the ability to get from town to town easily, and these newfangled automobiles were just the ticket. These wonderful roads pass several ponds and lakes. 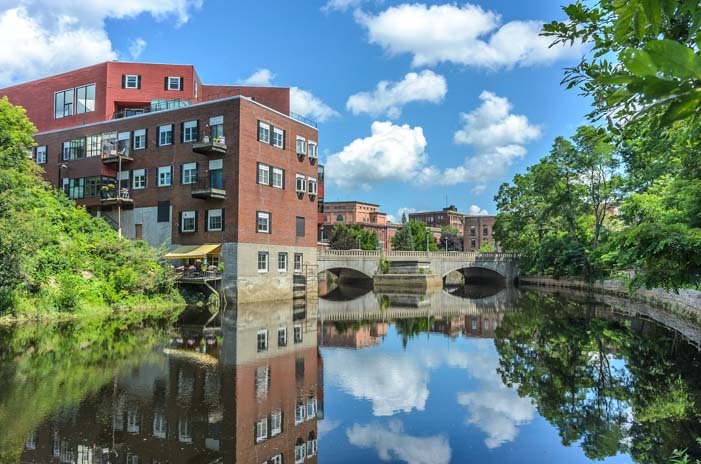 The state of Maine left it up to the local communities to decide for themselves whether or not automobiles would be legal on each town’s roads. 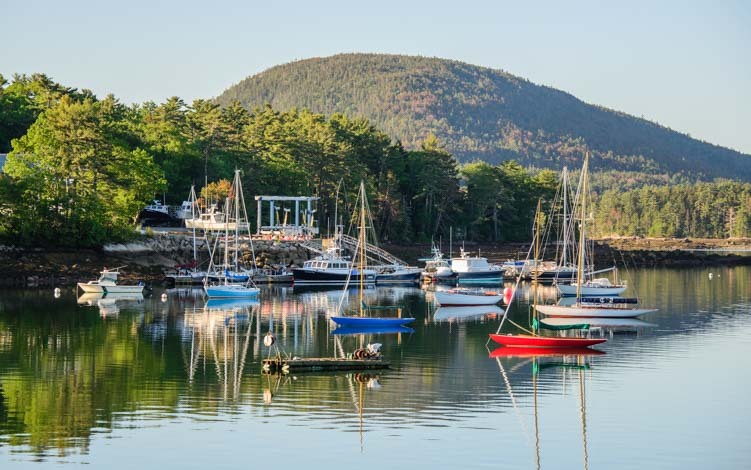 The upscale towns of Bar Harbor and Northeast Harbor, where the summer residents socialized and moored their yachts, voted to outlaw automobiles on their roads. 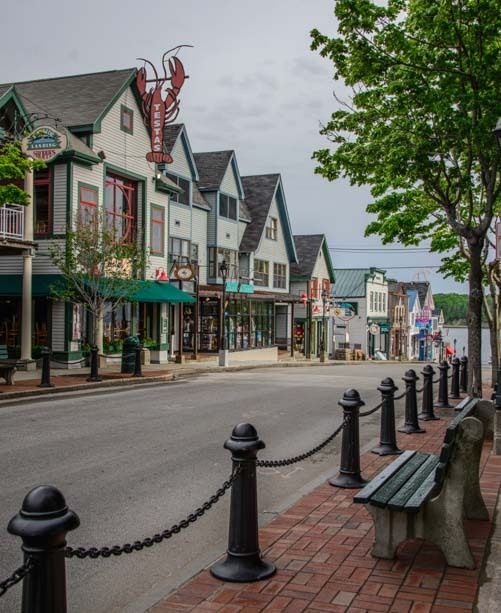 The more working class towns, like fishing village Southwest Harbor, voted to allow automobiles on their roads. In the end, after some human road blocks and a few arrests of automobile drivers caught flamboyantly breaking the law and driving on the wrong roads, by 1913 all the towns had agreed that cars were okay. Rockefeller hired masons to construct beautiful stone bridges. I’m not sure where the Rockefellers stood on this issue — they lived in Seal Harbor at the south end — but John D. Rockefeller, Jr., decided to build a Carriage Road system just for horses and buggies. These roads went around the interior of the island and were available for everyone to use. This gave all visitors and residents of Mt. Desert a way to enjoy the peaceful inland forests up close, without a car. John D., Jr., was an expert horseman and an experienced road builder, and he built lots of lovely roads and beautiful stone bridges. He kept buying up parcels of land and extending his road system until he had almost 50 miles of roads throughout the island. but carrying a map is a good idea! 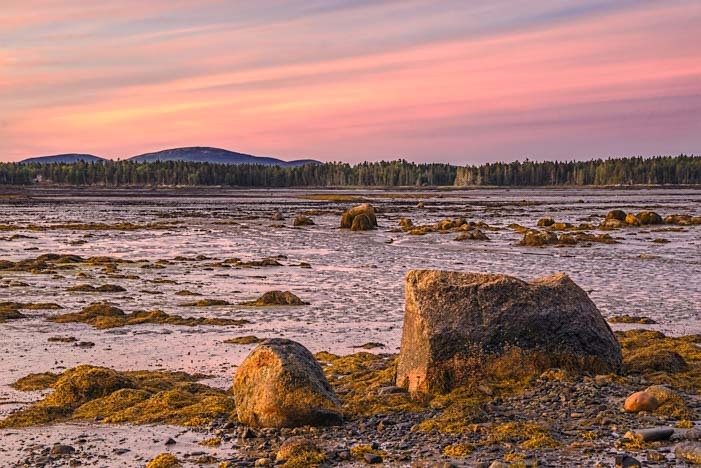 In the 1930’s, the National Park Service began putting together the foundations of what would become Acadia National Park, and Rockefeller ultimately donated all of these land holdings — with their new road system — to the National Park Service to become part of the new park. What a wonderful way to experience the Maine woods. I never knew much about the Rockefellers, but they are an incredible family. John D. Rockefeller, Sr., founded Standard Oil in 1870. By the end of his life in 1937 he had created a staggering personal net worth of $339 billion (in 2007 dollars). It is impossible to compare wealth across the centuries accurately, but to try to put his riches in perspective, he was worth a whole lot more than the top 3 of the world’s wealthiest people today combined. Bill Gates ($79 billion), Carlos Slim ($73 billion and Warren Buffet ($72 billion) are worth $224 billion all together. That’s $115 billion short of Mr. John D! Even adding in Mark Zuckerberg ($35 billion) leaves a gap of $56 billion. To think of it another way, Rockefeller was worth 4.3 times what Bill Gates is worth. Imagine someone with assets and/or income 4.3 times more than yours. Or imagine someone with assets and/or income that is one quarter of yours. That’s the difference between John D. Rockefeller, Sr., and Bill Gates. Nevermind the difference between Rockefeller and the rest of us! 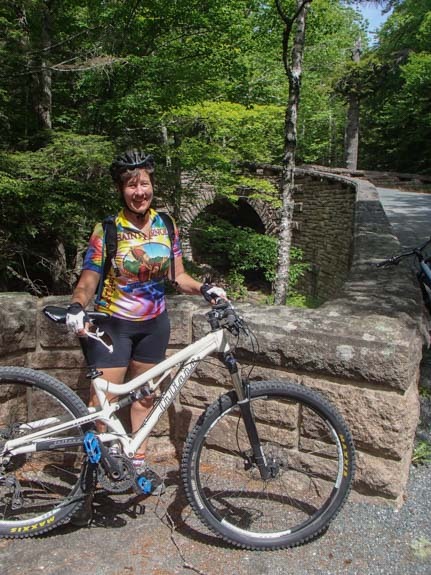 If you’re not into biking, there are other ways to experience the Carriage Roads! What is more, somehow John D. Rockefeller managed to pass on an incredible sense of personal motivation and high standards to his children. And they somehow passed that on to their children too. How common it is for the people who make the deepest impact on the world to have kids who flake out. Nevermind the flakey kids — who ever hears from the grandkids? In so many cases, the kids, grandkids and great-grandkids of the biggest movers and shakers of this world all float on their predecessor’s money with little motivation or interest in doing something remarkable. 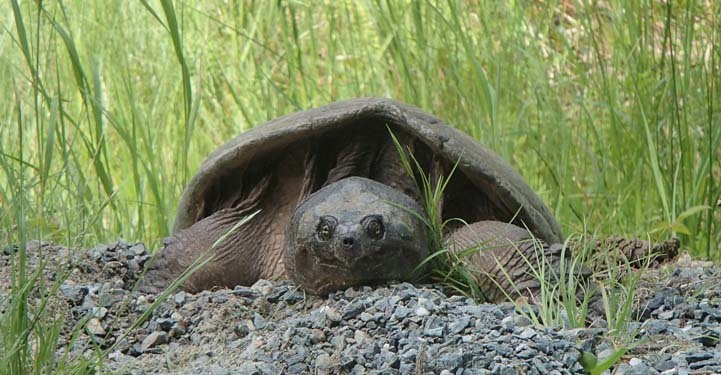 There’s lots of wildlife out here — this female turtle was busy laying eggs. However, while John D. Rockefeller, Sr., was a ruthless, cut-throat, and not necessarily fair playing owner of a total monopoly in the skyrocketing oil industry, at the end of his life he turned his efforts towards philanthropy, and that is where his kids picked up the ball and where his grandkids carried it forward. 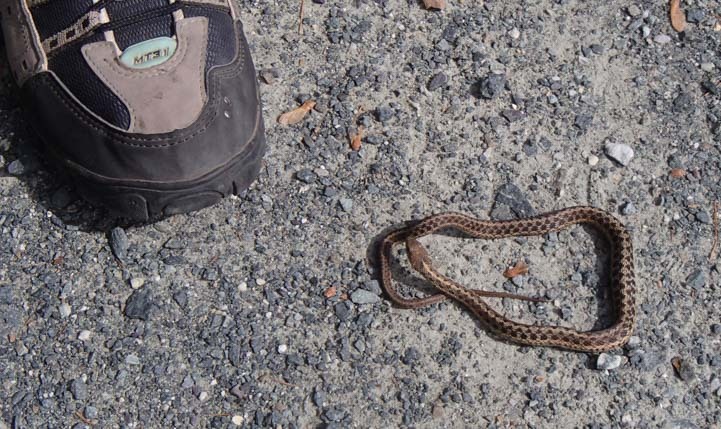 Just after seeing the turtle, we rode past a small snake. John D. Rockefeller had seven grandkids, five boys and two girls. One of these grandchildren, David, is still alive. Reading a little bit about David Rockefeller, I learned he was a highly accomplished man who stepped out of the shadow of his dad and granddad and made his own indelible mark on the world. 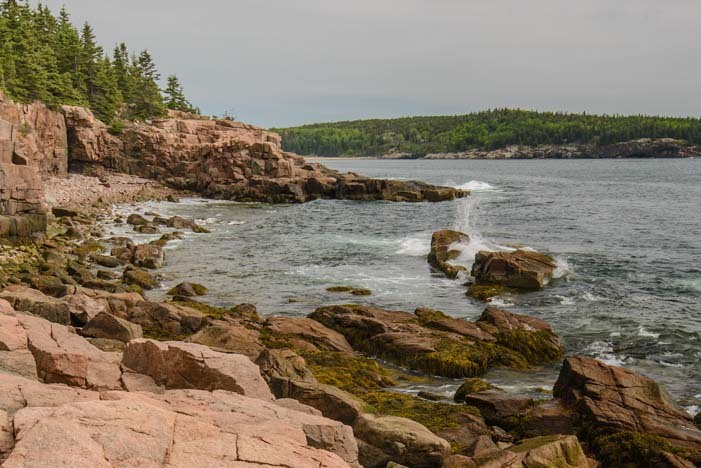 He celebrated his 100th birthday a week before our visit to Acadia National Park, and the Park Service rangers were all abuzz with excitement because he had just donated a huge parcel of land adjacent to the park for public use in perpetuity. Apparently David Rockefeller is quite a spry 100-year-old. A ranger told me she’d seen him cruising around on these Carriage Roads his father built in a horse drawn carriage! This bridge was a fun spot to take a short break. The Rockefellers acquired and gave away massive tracts of land all over the place to preserve the most beautiful landscapes and make them available for everyone to enjoy. When we were in Great Smoky Mountains National Park, we learned that half of the land that was donated and half of the money that was raised to create that park had come from the Rockefellers. 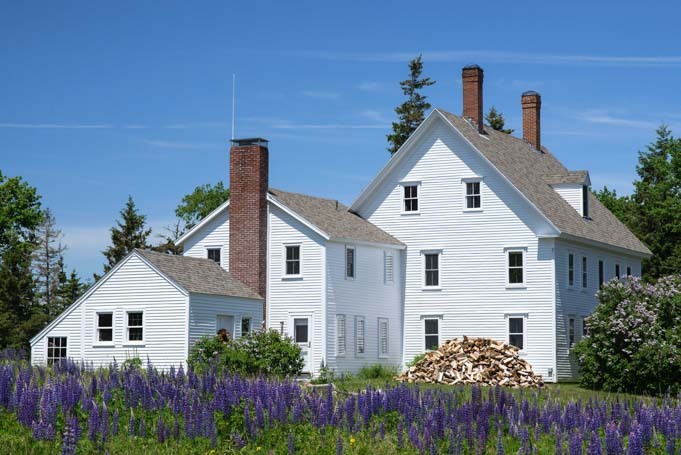 The other half was provided by local landowners, residents and the National Park Service. The Rockefellers had a major role in the creation or growth of many other national parks too, including Shenandoah, Yosemite, Yellowstone, Grand Teton, Mesa Verde, Redwoods and the Virgin Islands. We just loved these old stone bridges. It is really easy to bash the ultra rich, or be envious, or question how they got their money, and on and on. 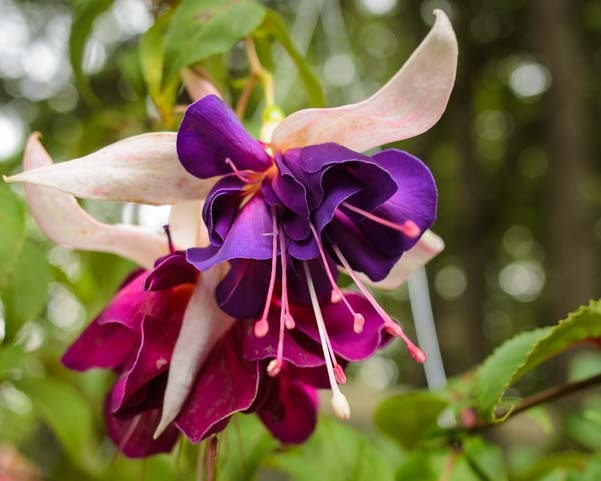 But if it weren’t for the Rockefeller family using their staggering wealth to preserve these unique tracts of land, they would have fallen prey to development. And the amazing thing is that the Rockefellers didn’t have to do any of it. In the case of the Tetons, John D. Sr., had to put up quite a fight to get the National Park Service to take his land. The process was a bit of a nightmare, and he could have thrown up his hands and quit. But he didn’t. So, we have the Rockefellers to thank for choosing (and sometimes fighting) to spend their money on us and on future generations of humanity. 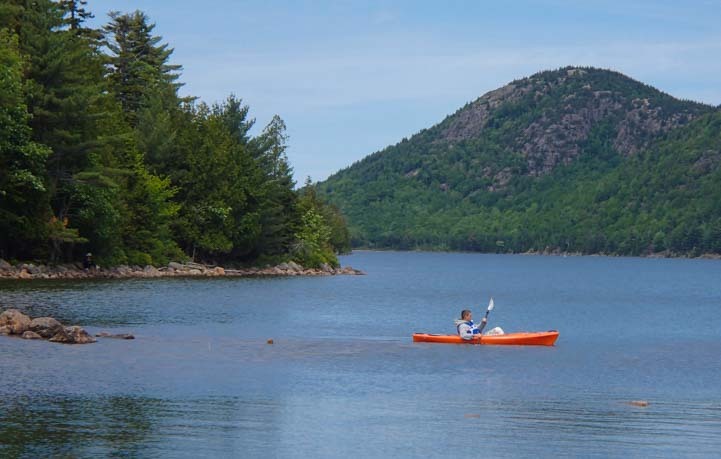 A kayaker at Jordan Pond. David Rockefeller, who just gave away all that land on Mt. Desert Island a few weeks ago, is worth only $3 billion now, a mere fraction of what Bill Gates, Carlos Slim and Warren Buffet are worth. Obviously, he could be worth a lot more if the family had kept their money to themselves. Perhaps with a nod to the example set by the Rockefellers, Bill Gates is busy giving away his fortune to fight disease and poverty in third world countries,. Three years ago, Warren Buffet gave each of his kids $1 billion with the requirement that they, in turn, give it away. The Jordan House is a great place to stop for lunch. This is all very heady stuff, but the Rockefellers have been on my mind a lot since we started traveling, because their name keeps coming up at so many of the national parks we visit. The depth of caring in that family for the beautiful places in America seems to have extended through the generations. A wonderful spot for a bike ride! We recently watched a thought provoking movie called America: Imagine The World Without Her. It’s a documentary made by a man who was born and raised in India, and it is fascinating to see this country through the eyes of someone who is not a product of it. It’s a highly political film. However, it is well worth watching, because it makes you think about the origins and spirit of this country. One of the most interesting points it makes is that after the American Revolution ended, and after General George Washington managed to wrest control of the locals away from the Brits, he broke with historical tradition. Unlike all the leaders in human history up until that very moment, he did not proclaim himself King of this new country and give himself and his heirs absolute power and authority over the populace until the next overthrow. Jordan Pond is such a nice surprise in the middle of all these woods. Since then, America has been a place of many kinds of firsts. Setting aside public land in the form of national parks was one, and the very first national park in the world was Yellowstone, created in 1872. Countries around the world have followed suit and preserved their natural treasures with gorgeous national parks that are open to the public. What a blessing for everyone alive today and for all that follow in the future, worldwide. 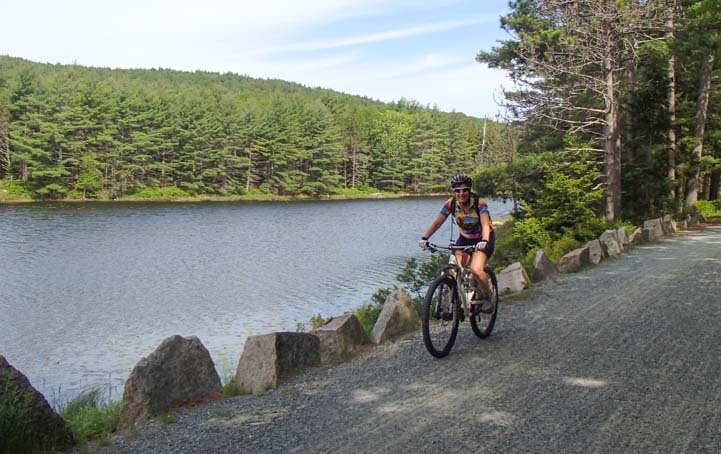 The Carriage Road at Bubble Pond. It is highly ironic that the polluting combustion engine, fueled by oil drilled from nasty, dirty wells, created the fabulous wealth of the Rockefellers who then turned around a generation and more later and poured their profits into the national parks. 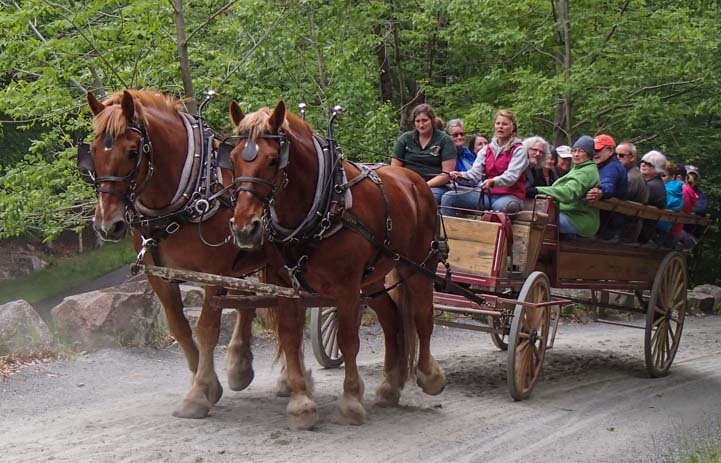 It’s ironic, too, that the family that benefited the most by the invention of cars and the related explosion in demand for oil was behind the creation of the unique Carriage Road system at Acadia National Park where the only legal traffic is human or horse powered. 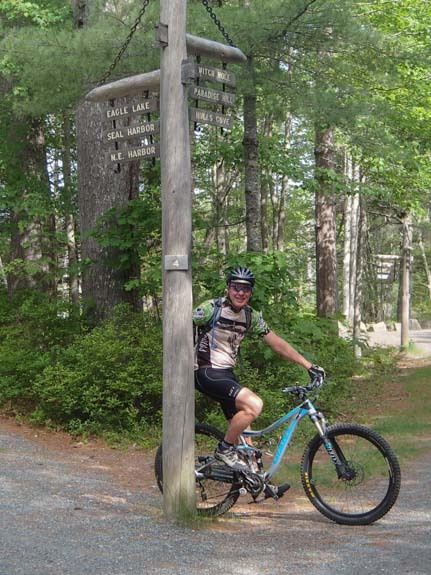 The Carriage Roads are very special! I guess a leisurely ride or stroll on this special road system through the woods inspires a bit of reflection. It did for me. 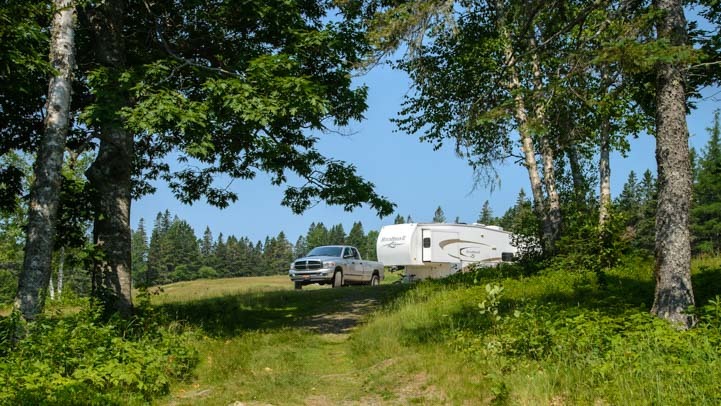 If you do some RV travel in Maine, or if you visit Acadia National Park by some other means, make sure you spend a little time out on the Carriage Roads in Mt Desert Island’s forests. You may find new thoughts, ideas and musings stirring within you. 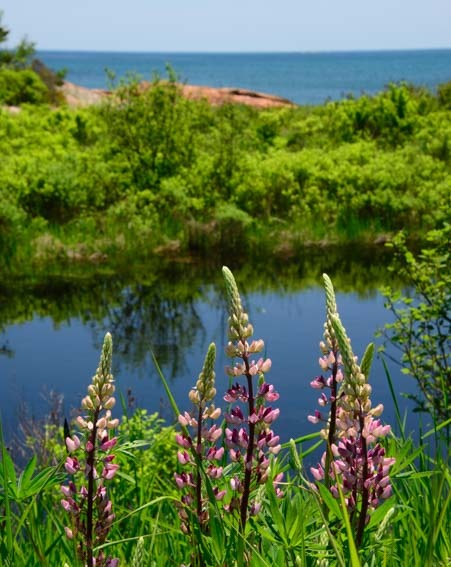 June 2015 – Maine’s Mt. Desert Island (pronounced “dessert” despite the spelling!) 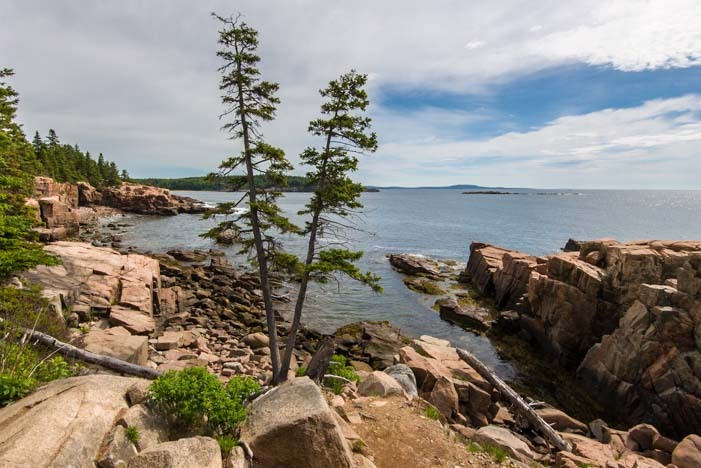 is home to several small harbor-front towns as well as lovely Acadia National Park. 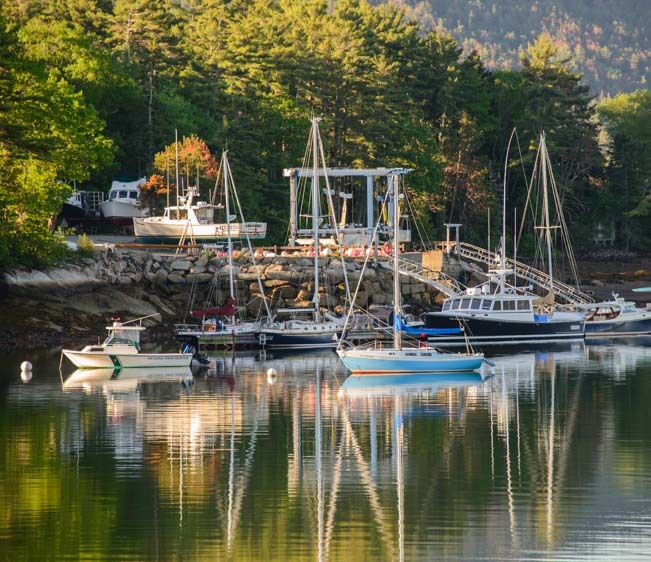 We made a beeline for the trendy and chic seaside town of Bar Harbor as soon as we got there. 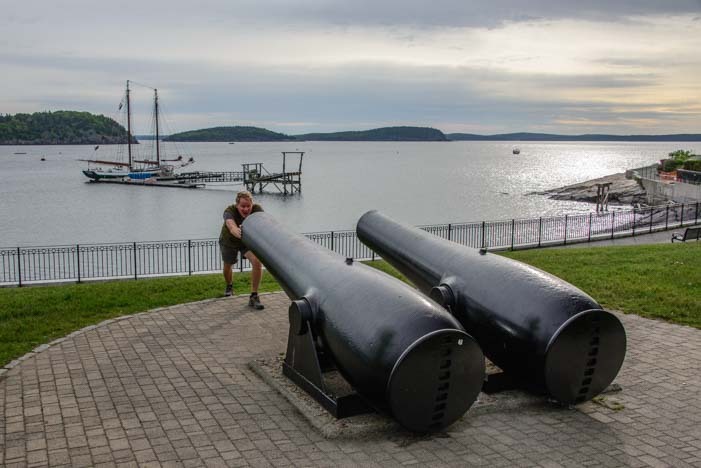 Two old cannons face the water in the middle of town, aimed almost directly at a pretty schooner in the harbor. Mark decided to have a look down the barrel of one! It was early in the morning, well before the crowds of tourists began to fill the streets, and we enjoyed the quiet and peaceful feeling of the place. This is an upscale town loaded with high end galleries and boutique shops, and it was nice to walk the main street and window shop completely by ourselves for a while. 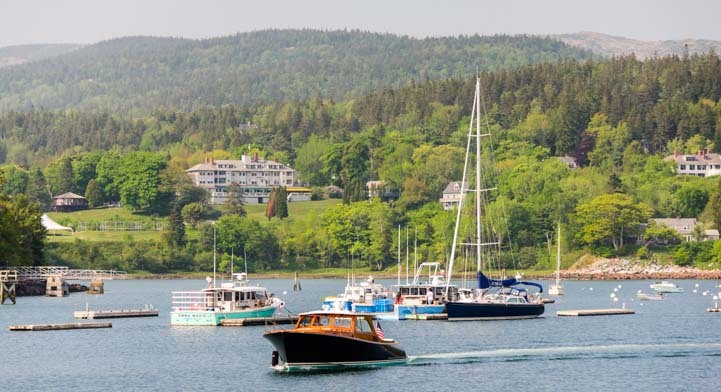 Another wonderful small waterfront town is Northeast Harbor (whose sister town, Southwest Harbor, lies across the bay). All of these towns made for fun excursions during our stay, and we spent many a happy hour walking along the docks and watching the boats in the harbor. 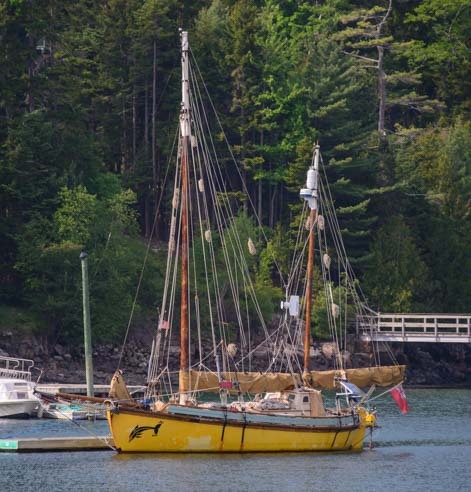 A lot of Maine harbors are geered primarily towards the lobster boat fleet, but Northeast Harbor is also home to many beautiful sailboats — and some unusual looking ones too! Mt. Desert Island is shaped something like a lobster claw with a pair of wide pincers hanging down. 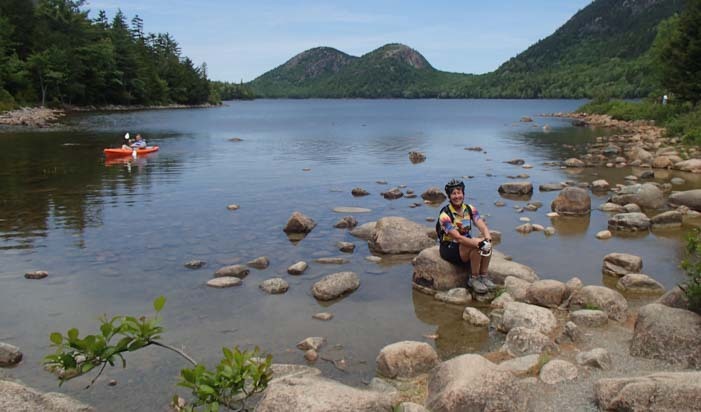 Acadia National Park takes up most of the eastern lobe and much of the western lobe too. In the eastern portion — the main part of the park — there is a Loop Road that passes the major sights. The eastern 2/3 of this road is one way, and in our excitement to see it all on our first day in Acadia, we blew right by the visitors center, missed some key signs and wound up at the far end of the loop road facing the wrong way, trying to figure out how to see the park. Oops! We got ourselves sorted out the next day and, map in hand, drove the loop clockwise as you are supposed to! Stopping at some of the viewpoints, we were quickly swept up in the beauty of the craggy shorline. 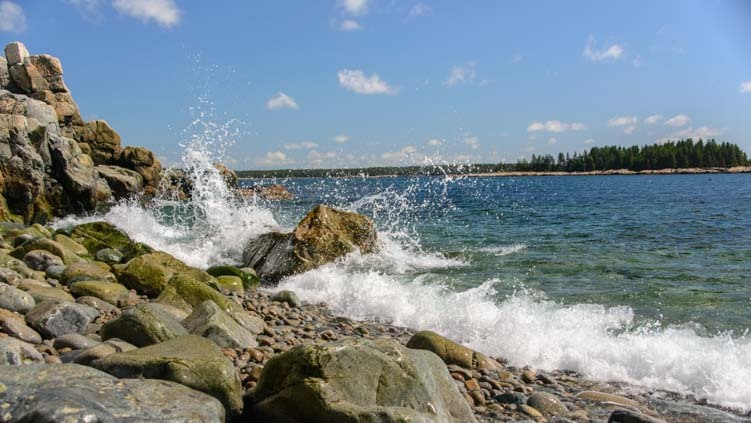 Crashing surf on Maine’s rugged coast. There were wonderful, huge granite boulders, and some of them even held tidepools. I love these northeast tidepools. 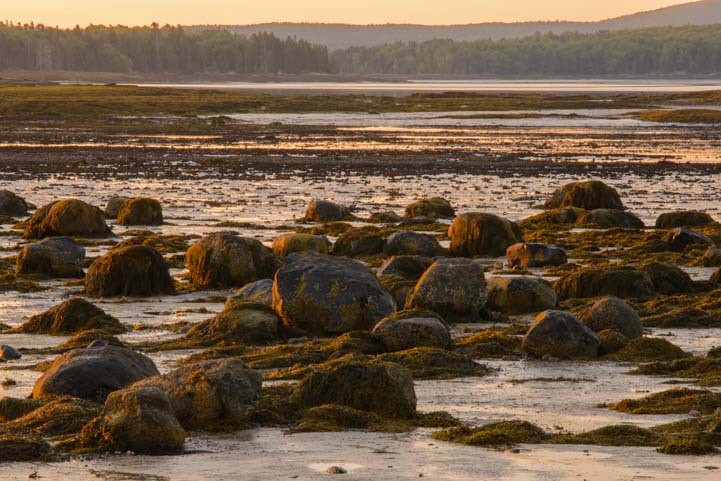 There are whole ecosystems of algae, seaweed, periwinkels and limpets living in them, and many are lined with an ultra soft and rich red velvet that is some kind of algae. 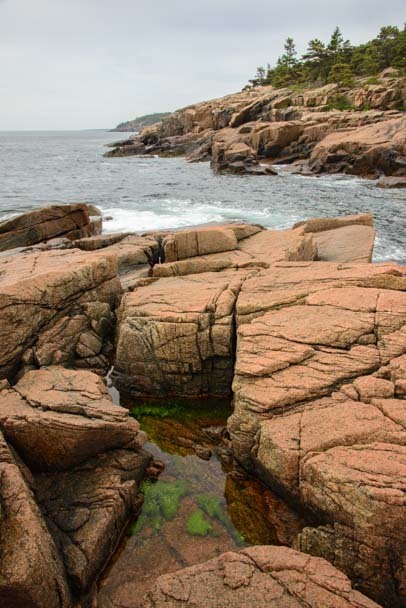 We LOVED the mix of pine trees and jagged granite boulders on the coast. 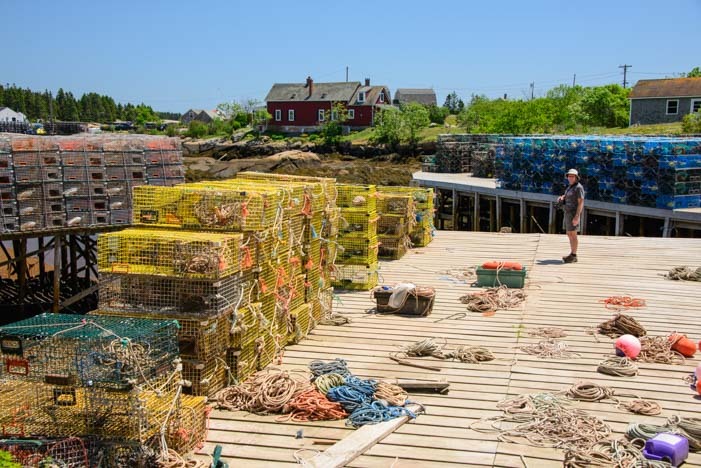 I wandered way off so I wouldn’t keep getting in Mark’s photos, and around the bend I saw a lobsterman busy hauling his traps. I took a bunch of photos of him and then noticed that he waved to me. I took my camera down from my face to wave back. When I raised it again, I saw through the telephoto lens that he hadn’t been waving — he’d been holding up a wriggling lobster for me! Unfortunately, he dropped the lobster into his bucket before I realized what he was doing, and I missed the shot. I didn’t realize he was showing off a lobster for me to photograph until too late! 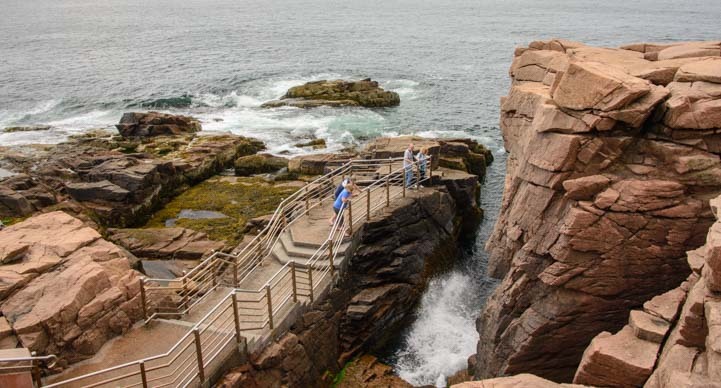 One of the most popular attractions at Acadia National Park is Thunder Hole, an opening in the rocks where the waves crash in and out, sending up a huge spray of water. To see the biggest spray, you have to catch it as the tide is coming in. The tide was going out when we swung by, but it was still neat to hear the gurgles, gulps and belches booming between the rocks far below as the waves washed in and out. 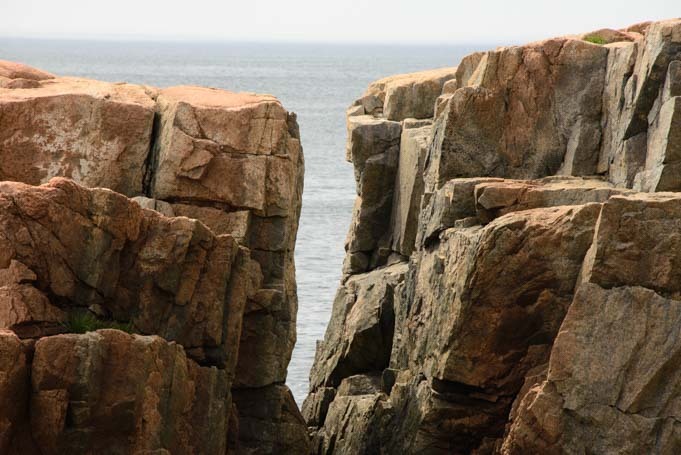 Thunder Hole – Booming sounds on an outgoing tide plus huge splashes on an incoming tide. This shoreline is very alluring, and we had such fun scrambling over the rocks. I swear, these kinds of big boulders bring out the kid in me. A touch of drama in the sky. 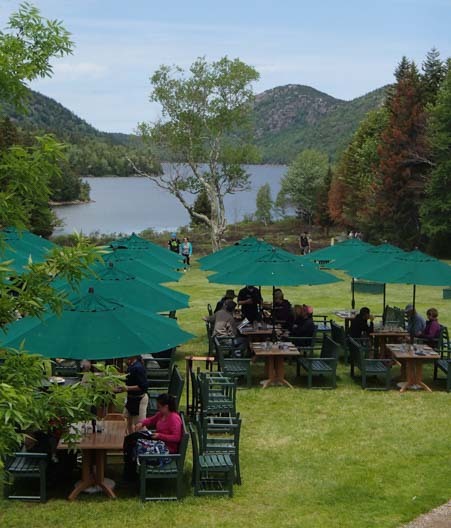 Acadia National Park is a very popular place, and the park was very busy even though we had arrived ahead of the summer crowds (New England public schools were still in session because they’d had so many snow days during the endless winter blizzards). The roads are narrow and winding, and some crazy people like to bomb down them like they’re a racetrack. 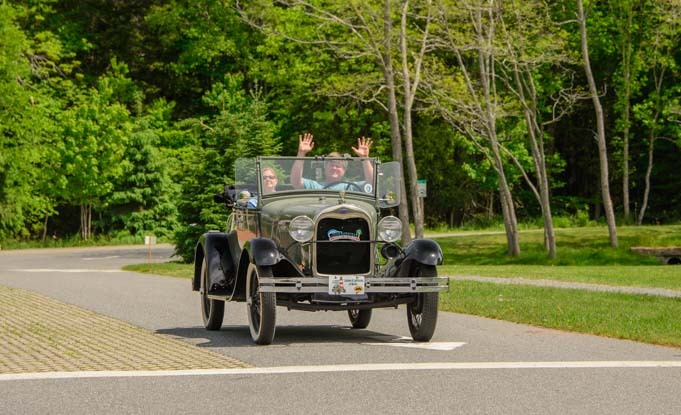 One group of travelers, however, was enjoying every minute of slow driving on these roads — a Ford Model A club! They were so cute that none of the other drivers objected to their pace. Some 170+ Model A’s attended this rally, and everywhere we went we ran into little groups of them. Seeing them out on the roads was lilke stepping back in time. A Ford Model A rally took us back in time. This group was having a ball, and the weather was perfect for them, so they drove around with the tops down and their beautiful leather suitcases strapped on the back bumpers. Those guys were having too much fun! Enjoying a fabulous road trip! These guys were all over the park. What fun! 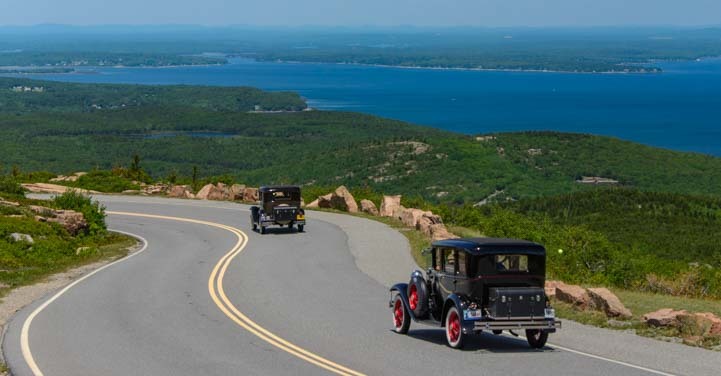 Another Acadia National Park favorite is to take a drive to the top of Cadillac Mountain, the highest point in the park. We zoomed up the mountain, watching the views grow ever larger around us. And who was waiting for us at the top? A bunch of those Model A’s!! 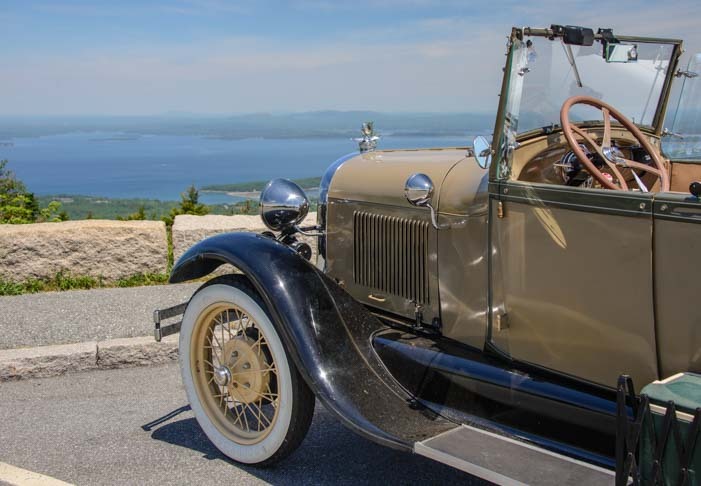 The views were truly beautiful — you can see the many islands of Frenchman Bay in the distance — but we got the biggest kick out of watching these cute Model A’s drive down these wonderful roads. 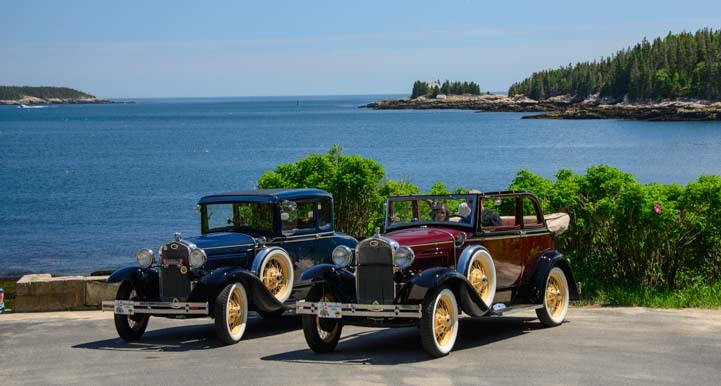 They had come to Acadia National Park from all over the country, most making the trip on their own four wheels. One club member even hailed from Australia, although he’d left his Model A at home. What a classic image descending Cadillac mountain! If you take your RV to Mt. Desert Island, unless it is fairly short in length and short in stature, you’ll be happiest leaving it behind as you tour the park. The scenic viewpoint parking is not RV friendly and there are bridges on the Loop Road as low as 11′ 8″. We enjoyed a fabulous stay at Narrows Too RV Resort, about 7 miles north of the north entrance to the park. 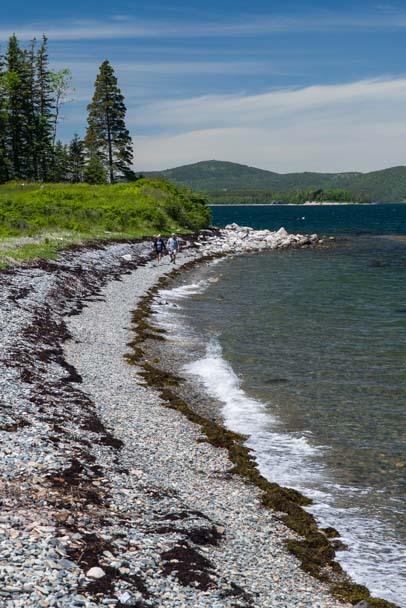 Acadia National Park – Official National Park Service Website. Click “View Map” for a map of the park. Here are some of our blog posts with similar themes! 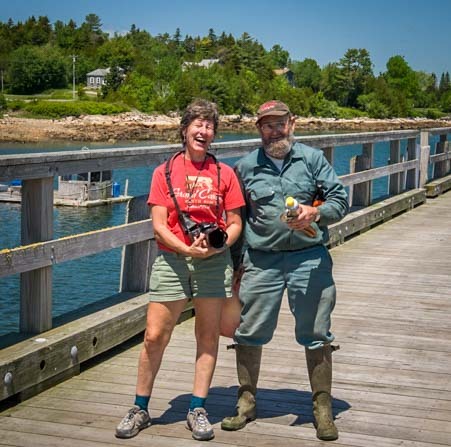 June 2015 – After our mad dash up from Virginia through Pennsylvania, New York, Massachusetts, Vermont and New Hampshire, we traveled across western Maine on Route 2 and arrived at the Atlantic Coast. Somewhat dazed by the trip, our minds were still filled with residual visions of lush green Blue Ridge Parkway forests and waterfalls. What a fabulous shock and change it was to run down to the shoreline on Mt. 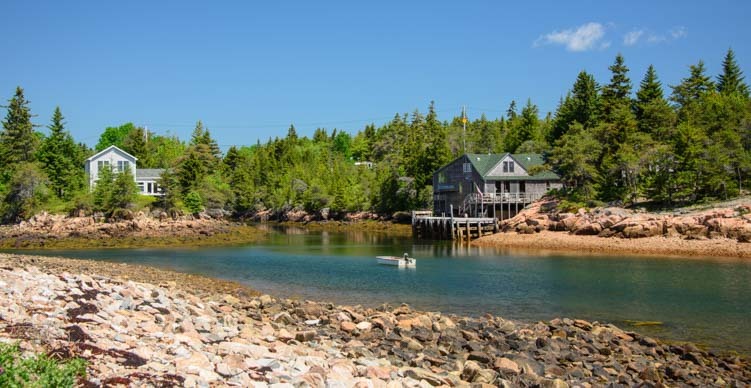 Desert Island and see craggy granite boulders, expansive blue water, and lobster boats puttering about in the bay! The air was crisp and salty, and the sun was warm on our faces. We pranced along the shore happily taking an endless stream of photos. We’re on the ocean again! 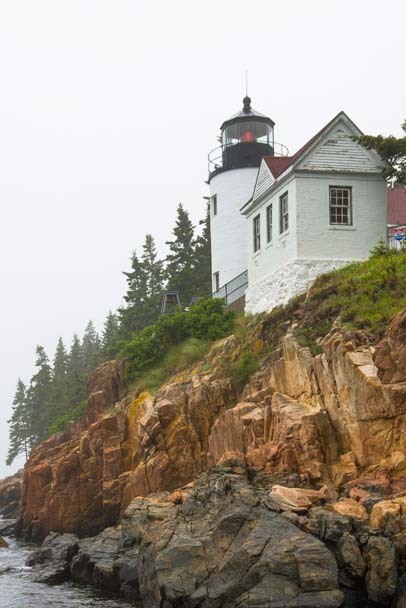 We had no idea what to expect from Acadia National Park. Years ago I had driven to the top of Cadillac Mountain, which stands like a sentinel in the middle of the park. I remembered it as a terrific place to take in the views of all the surrounding coves and islands around Mt. Desert Island. But my memory was fuzzy, and I hadn’t seen the rest of the park. And Mark had never been to Maine at all. 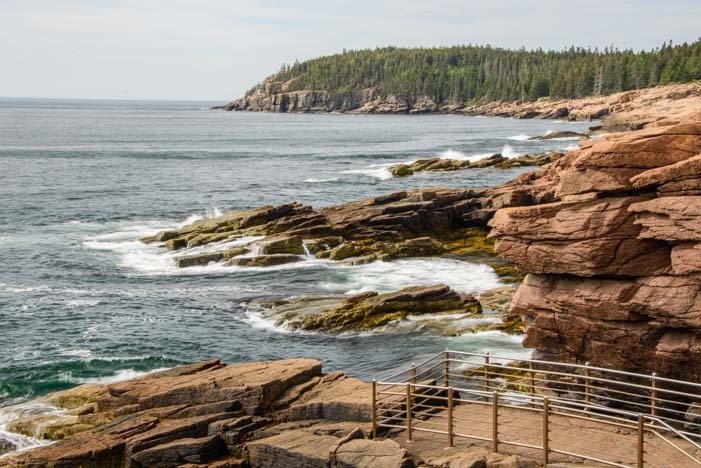 As we began to research the options and activities available at Acadia National Park, our pile of tourist literature grew and we realized there was so much to see and do that we could come back summer after summer and never get it all done. 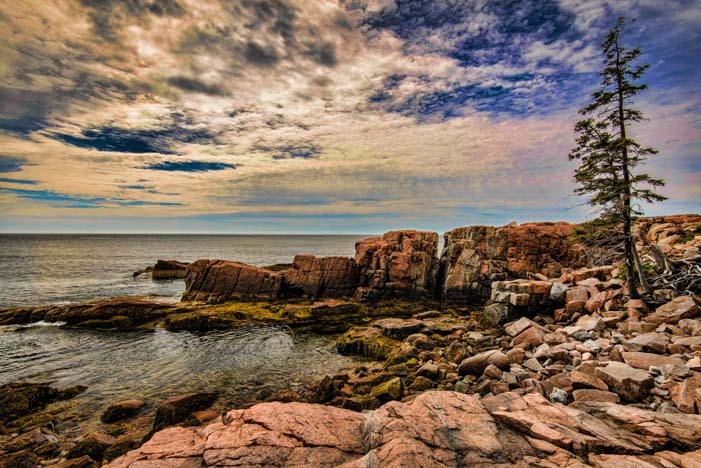 No wonder Bostonians and New Yorkers flock to this national park every summer! The problem was finding a place to stay. Most of America’s National Parks are surrounded by National Forest, and we usually find a place to boondock that is within shooting distance of the park we’re visitng. 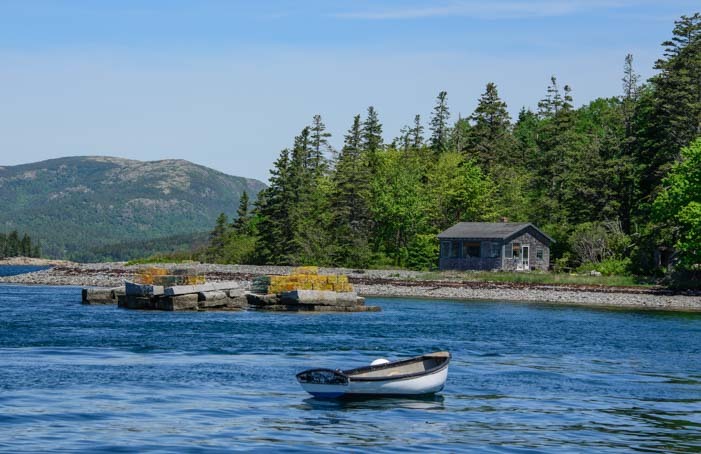 But Acadia National Park is surrounded by wealthy communities of summer homes and quieter villages of fisherman — all private land that is ardently protected from tourists. So we were absolutely overjoyed when — totally out of the blue — we received an email from Thousand Trails, the RV campground network, asking if we would like to give up our boondocking ways for a little while and stay at one of their affiliate RV parks for four days. Are you kidding? What totally perfect timing! YES!! 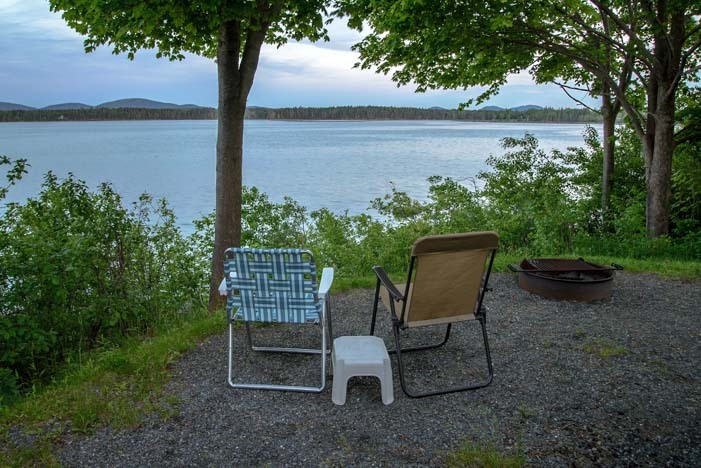 They found a spot for us at Narrows Too RV Resort, a waterfront RV park right on Mt. Desert Narrows, a body of water that separates the mainland from Mt. Desert Island where Acadia National Park is located. The landmark for making the turn into Narrows Too RV Resort is a classic Maine lobster shack restaurant! Narrows Too is right across the street — very handy! This park is laid out on a very gradually sloping hill so that as you walk from the office through the campsites to the water, the views of the bay get bigger and bigger. It was slightly pre-season, so the park wasn’t full to capacity, and the waterviews between the RVs were lovely. 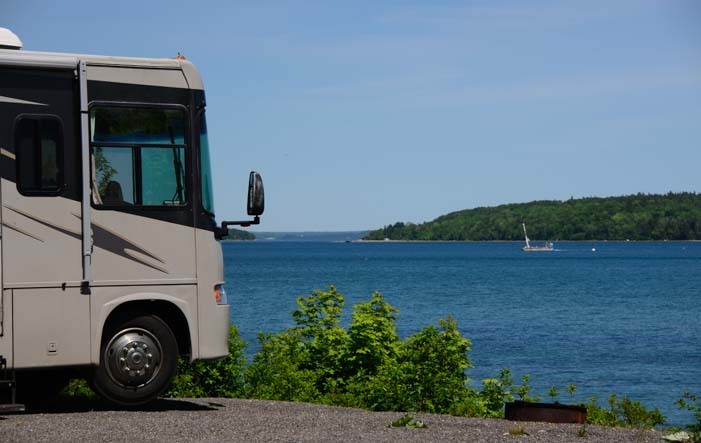 Narrows Too RV Resort – on the waterfront! Quite a few of the sites are directly on the water. Fifth wheels had backed into these sites and motorhomes had nosed into them to make the most of the wonderful views. I’m not sure what our guardian angel had done to put all this together for us, but Thousand Trails rolled out the red carpet for us and put us in the finest site in the park. We backed in and set up our camping chairs facing the view, and whooped and hollered for quite some time. What a fabulous campsite!! Wow! What a place to set up camp for a few days!! The Mt. Desert Narrows waterway is tidal, and it was fascinating to watch the tide roll in and out everyday at our site because the water covers a very large distance and moves really fast. At low tide there was a wonderful moonscape of rocks the stretched all the way across the bay, and at high tide the water came right up to our site. We loved the shade and enjoyed watching the tide come in and out behind our rig. Mark snuck down before dawn one morning to catch the sunrise. The first spray of light across the rocks was a soft pink. A little later the sun crested the horizon and turned the land orange for a split second. A lobster boat was moving about in the distance. Then the light softened again and the rocks began to glow. What a cool place to enjoy a cup of morning coffee with a view! A rocky moonscape that disappears when the tide comes in. We were backed into our site, and the view from inside our rig was wonderful too. It was hard to tear ourselves away from this beautiful and ultra private and scenic little corner of the world. Walking the campground loop, we found other folks were enjoying their waterfront sights just as much as we were. Glorious sunny days brought everyone out. And we learned that Thousand Trails has a very cool camping program where for $545 per year, you can stay in any of their parks in your chosen region for up to 30 nights for free and for just $3 a night after that. At times (like now), they offer two zones for the price of one. This makes a lot of sense for people that plan to use their RV predominantly in one region of the country during a given year, for instance, seasonal and full-time RVers who will be spending the winter in southern California or Florida, and for working folks who want to enjoy their RV on weekends and shorter vacations close to home. 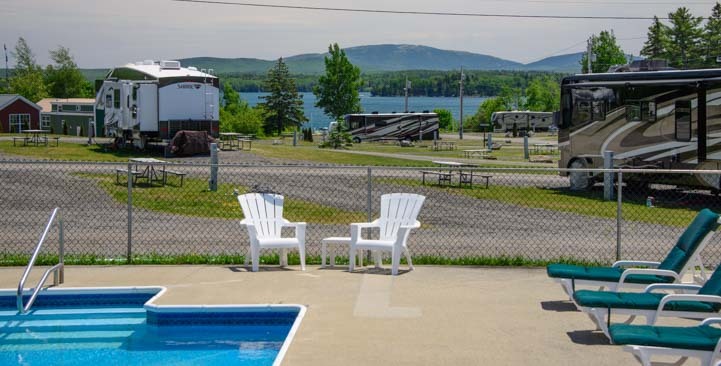 A side benefit for Thousand Trails members is that they get a 20% discount on camping fees at RV parks in the Encore RV Resort network (of which Narrows Too is a part) as well. Waterfront dining right outside your doorstep! The heavens blessed us with some fantastically clear and sunny days. We didn’t take a dip in the pool — summertime heat hadn’t quite hit yet — but it looked like a great spot to kick back. By the 4th of July this pool will be jumping! 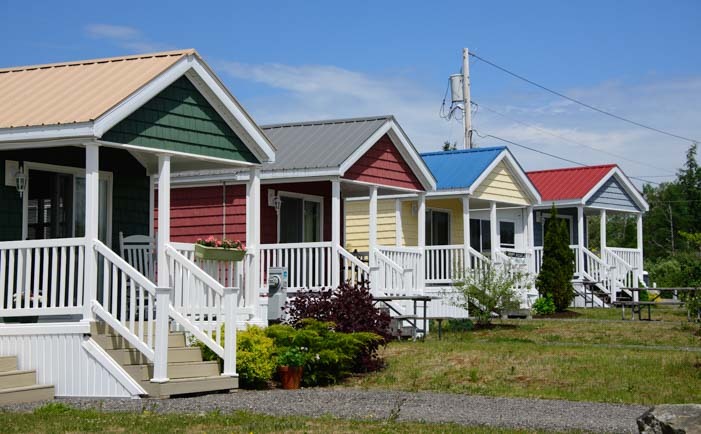 This RV park has cottages for rent too: one group that is brightly colored and has kitchens and another group of rustic log cabins for cozy nights in the woods. For non-RVers, these pretty cabins have kitchens. For a more rustic experience, how about a log cabin? 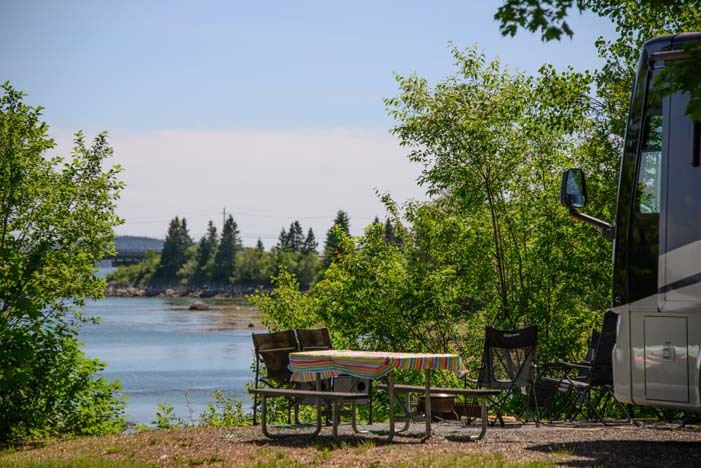 With such an ideal home base to tour from, we were torn between just lounging around the RV park all day everyday and actually going to see the sights at Acadia National Park. But the beauty of Maine finally won out and lured us away to some great adventures. Two very happy Thousand Trails campers! How wonderful it was, though, to come home each evening after a day of energetic sightseeing to relax in a really lovely setting. If you take your RV to Mt. 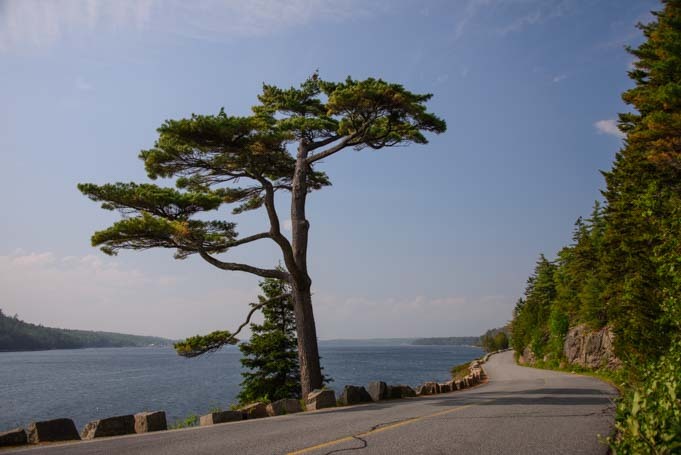 Desert Island and Acadia National Park in Maine, Narrows Too RV Resort is an excellent place to stay. The island is not especially RV friendly, and there are some roads in the National Park with bridges too low for many taller RVs! 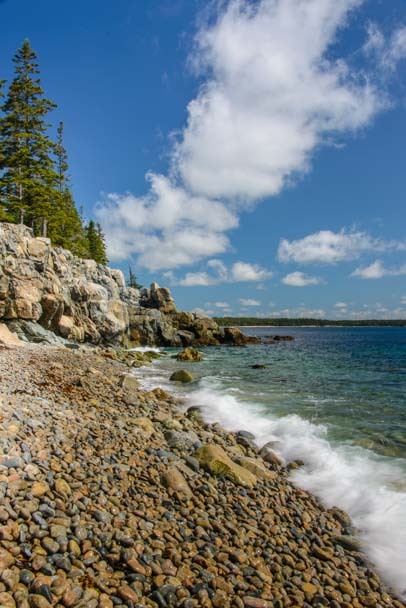 Acadia National Park and all the things to do nearby are very spread out, so finding an RV Park or campground that is close to the hot spots is tricky. 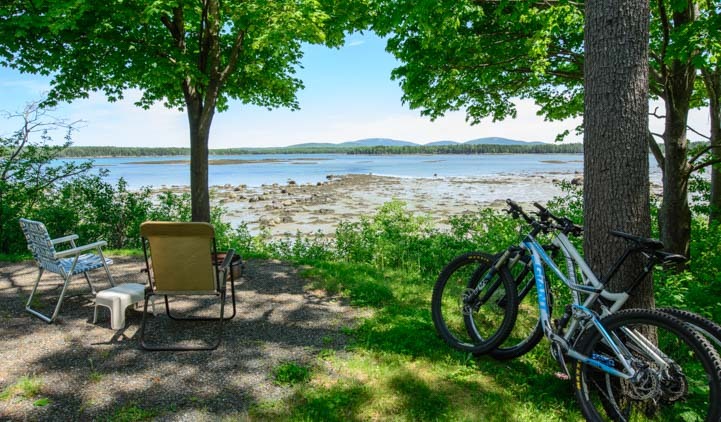 Narrows Too is ideally located — just 7+ miles from the north entrance to Acadia National Park, 12 miles from the popular seaside town of Bar Harbor and 8+ miles from the city of Ellsworth. 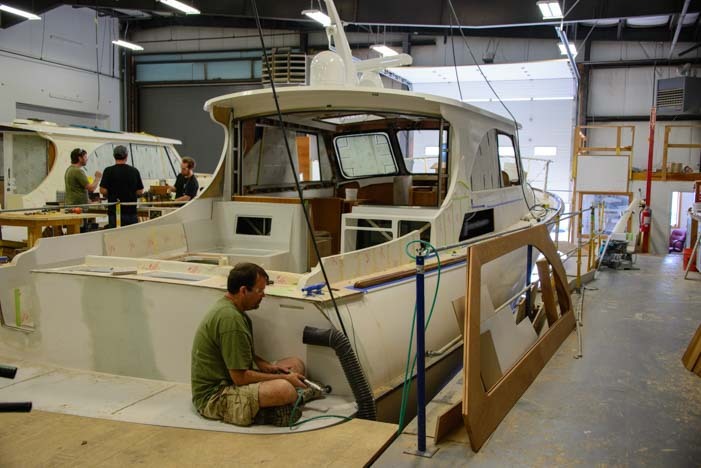 Hinckley Yachts – Now Hiring! Yachts leave the factory for great adventures on the ocean. We did a quick U-turn and decided to have a look. Not because we need a job, but because Hinckley Yachts are among the finest yachts built — and we had just driven right past their factory! We stopped inside and asked if we could take a tour. Within minutes a really nice young fellow named Chris, who’s been with the company for 12 years, handed us safety glasses and off we went! What a wonderful surprise to be given a spontaneous factory tour! His enthusiasm for the company was infectious, and as we saw how these phenomenal boats are made, and the energetic environment they are made in, we could understand why. Hinckley Yachts was founded by Benjamin Hinckley in 1928, and Hinckley has long been one of the highest end custom yacht builders around. 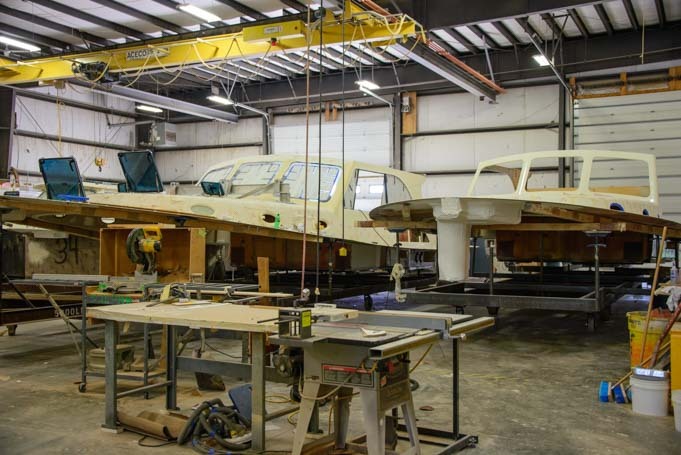 Once the dream boat of sailors in every yacht club, almost all Hinckleys being built today are powerboats ranging from 29 to 55 feet (and from half a mil to several million dollars apiece. Ahem!). The cabin “pan” bow section of a power boat under construction. 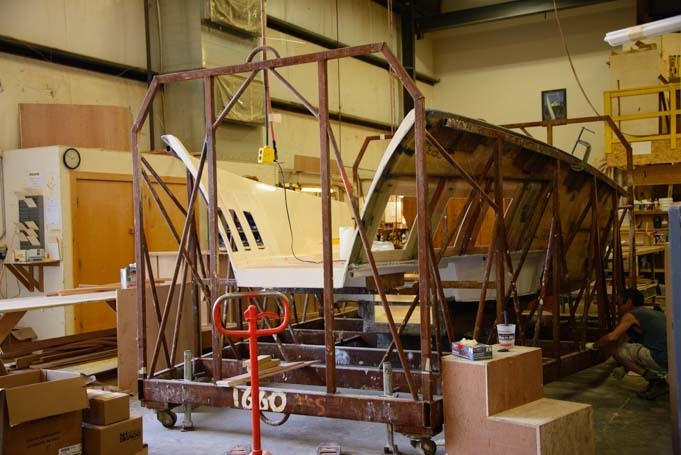 Hinckleys are assembled using modern nautical engineering techniques, forging three separate fiberglass pieces together: the hull, the cabin (which Chris referred to as the “pan”) and the deck. 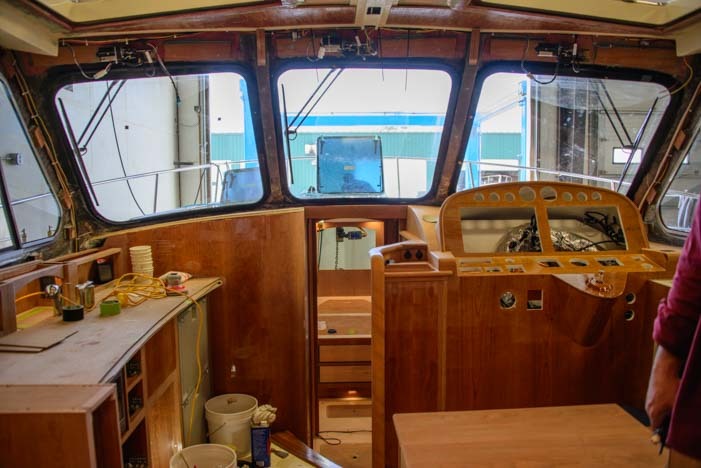 Our Hunter 44DS sailboat was assembled the same way, as are most modern production sailboats, and the finished product is a stiffer and more resilient hull than the old fashioned method of using “stringers” (like floor joists) as ribs in the hull. Many boating traditionalists were skeptical of this business of building the cabin separately and then lowering the cabin “pan” into the hull back when the lower end boat builders like Hunter and Beneteau started doing it, but if Hinckley is doing it now, then it must be the best way to go! Power boat deck sections get assembled. 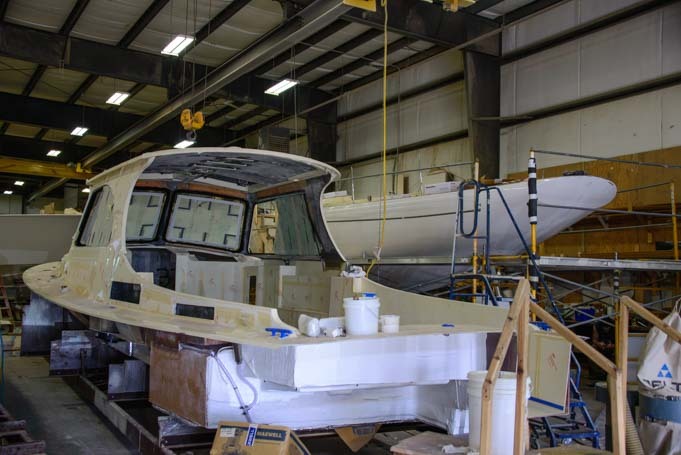 All Hinckleys are built with kevlar along the entire length and breadth of the hull, from the waterline down. By comparison, our Hunter had a kevlar reinforced hull from the waterline down in the forward section from the keel to the bow, which is unusual for a cruising sailboat in its class. When we visited the Hunter factory before buying our sailboat Groovy, we learned that they test their new models by driving them into the beach at top speed while engineers with probes, sensors and clipboards take notes, look for leaks after impact, and refine their designs. Chris didn’t say that Hinckley crash tests their new boat designs, but these boats are built to go anywhere and do anything, and they can be found all over the world. A completed cabin “pan” section is lowered into the hull. 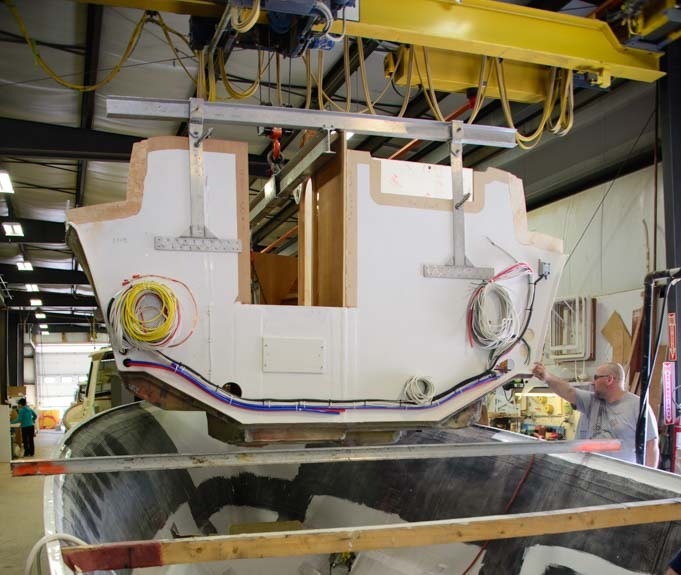 Once the pan is situated in the hull, then the deck is lowered onto the whole thing and sealed with 3M 5200 and other sealants. Finished product – Let’s go! 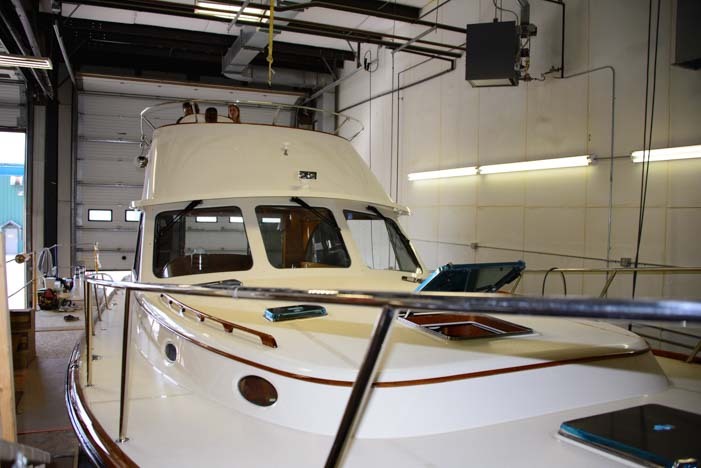 What Hinckley is known for is the gorgeous fitting out that each boat receives. 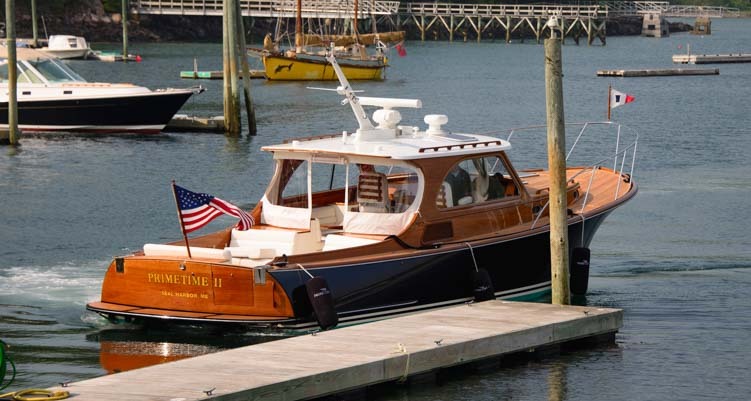 Hinckley builds boats strictly to order, so every one of the 30+ boats that are in production at any one time have been purchased by an individual. Lower end production boats are built 95% of the way at the factory and then commissioned the last little bit by the dealership. On our sailboat, the AGM batteries, and engine alternator were upgraded by the dealership for the owner that commissioned the boat. 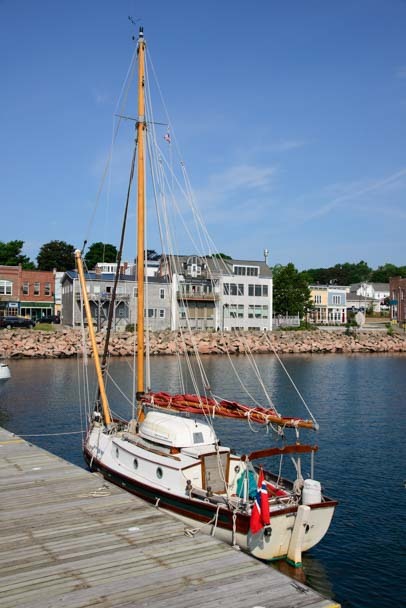 Most sailboat buyers have a dodger made locally as well, rather than going with a factory dodger. Hinckley yacht interiors are truly lavish. Not so with Hinckley. 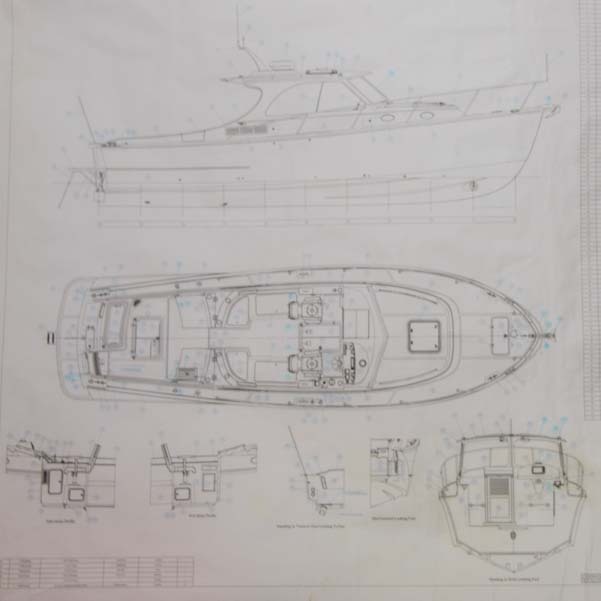 The wealthy folks that buy these boats can request anything they want, from specific navigation electronics, to different woods and interior layouts, and on an on. 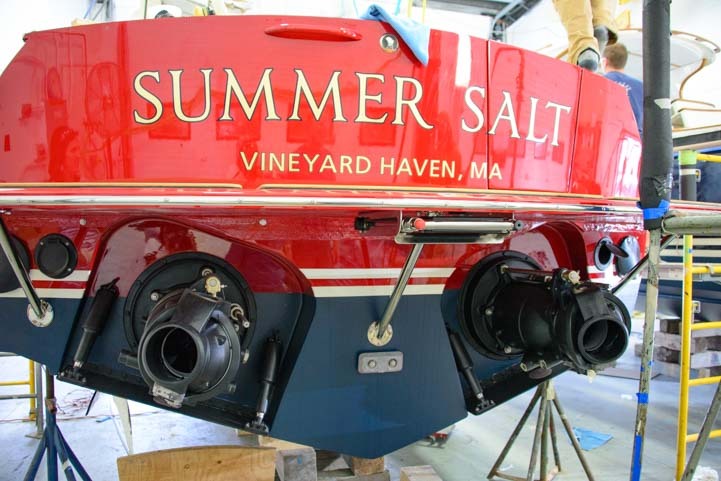 Most of the buyers are repeat customers who are upgrading or just need another boat. Many of the buyers are celebrities, so it’s not uncommon for the factory workers to see a famous person arrive with their entourage. 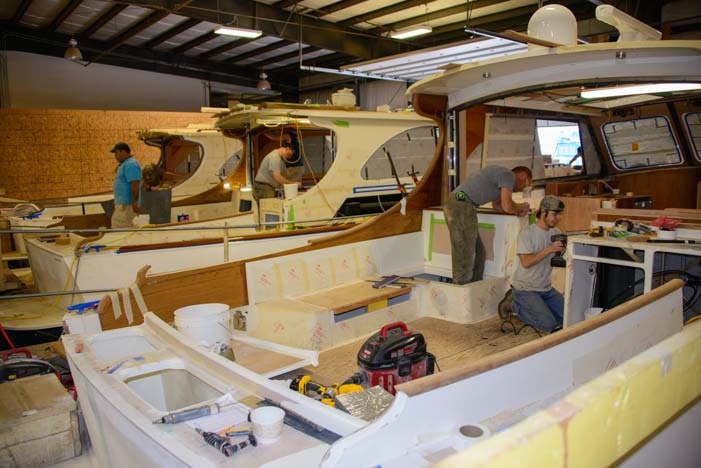 Sometimes the celebs send representatives instead, and frequently an interior designer or other consultant will show up to specify how the boat should be outfitted. You can specify anything you want on your Hinckley! All boat builders (and RV manufacturers) had a terrible time with the financial collapse of 2008, and Hinckley sharnk to just 40 employees and 4-5 boats on the production line at the time. Now they employ 265 people and they are going gang busters. 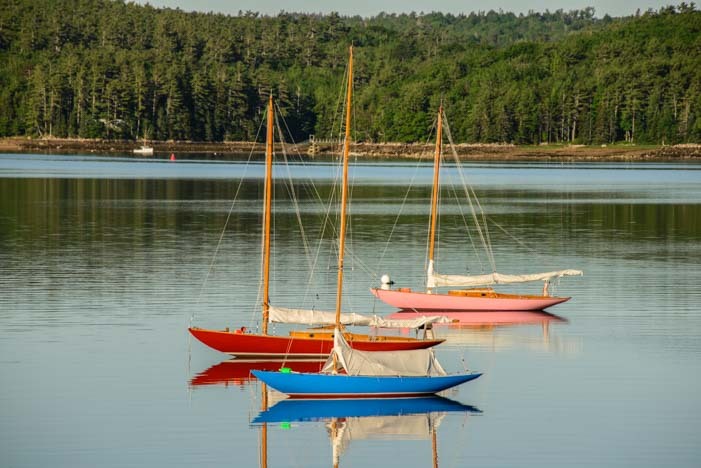 What put Hinckley on the map in the last two decades wasn’t their gorgeous Sou’wester sailboats that sent their reputation soaring in the latter half of the 1900’s. Hinckley’s modern essence is power boats! Back in 1998, they started putting jet drive engines into their power boats. These engines similar to the ones used on jet skis, and they Hinckley’s boats completely. Without a prop, a Hinckley poweryacht of 40 to 55 feet can float in just 2 to 3 feet of water — ideal for the Bahamas where every bay is super shallow — and they can cruise at 30 to 40 knots easily!! Wouldn’t it be fun to step off the swim platform into waist deep water and walk onto a deserted palm tree studded white sand beach?!! 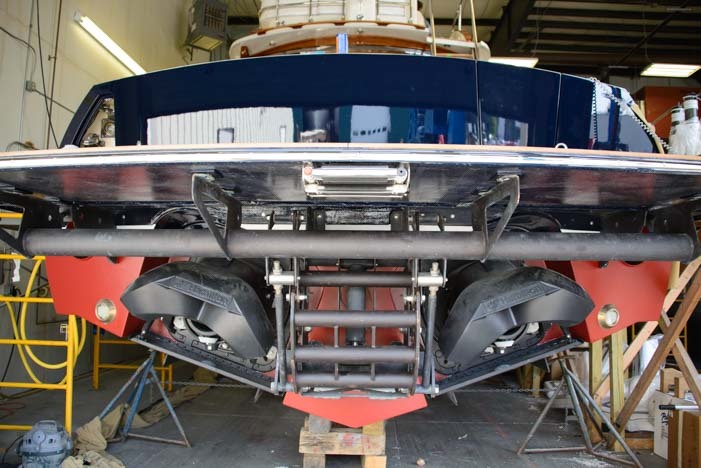 Transom view: Jet drive engines make Hinckleys both shallow drafted and very fast. So, with your deluxe Hinckley poweryacht you can jump from Ft. Lauderdale to the westernmost island in the Bahamas in a little over an hour, and you can spend the winter season anchoring in bays that few other boats can get into, all while enjoying the sheer luxury and space and amenities of a 55 foot top-of-the-line yacht that was built just for you. What a way to go!! Hinckley yachts on the production line. But how much diesel fuel does it take to power twin Yanmar 260 horse power engines at cruising speed? Oh, somewhere on the order of 23 gallons per hour per engine. That’s chump change for the folks that can buy these boats, but if you want the wind to power your boat instead, Hinckley still makes stunningly beautiful sailboats. While we were there, a 42′ day-sailer was on the line. What makes such a big yacht just a day-sailer? The mini cuddy cabin is very small. Rather than going out for a daysail in a little Sunfish or Hobie cat, why not take your 42′ yacht? Ready for some summertime fun. Now, these wonderful boats are not megayachts like we saw all through our cruise in Mexico. Our British yachtworker friend Derren has the unique dream job of flying all over the world to the most exclusive and fanciest marinas on every coast to do warranty work on British Sunseeker megayachts. Hinckley yachts are of the same caliber but max out at a half or a third of the length of Sunseekers. We were amazed to learn that many Hinckley poweryachts are actually used as tenders to megayachts. Chris said it’s not uncommon for their customers to pick up a 43′ Hinckley to be a tender to a 200′ megayacht. They even had one customer who found that one 29′ Hinckley runabout wasn’t enough for his megayacht, so he had them build a second one. But 29′ was too long for the spot he wanted to stow it on deck, so he had them make new molds and redesign the 29′ runabout to a shorter 26′ version, just for him. If you are in the class that can buy two Hinckleys and have the second one be a total redesign of the standard fare, then you aren’t really watching your wallet when it comes to repairing these things down the road. Sheer elegance on the water — and skillfully driven too! However, for luxury yacht owners on a budget, it turns out that the warranty on Hinckley yachts is lifelong, and we chatted with one fellow on the line who has done warranty work on boats that are decades old, all at no cost to the owner, even the current owner didn’t buy the boat new from Hinckley. No need for a third party RV warranty on these babies! An hour after we drove off from this really fun tour, we were prowling around the cute town of Northeast Harbor when we looked out on the water and saw a familiar shape — a Hinckley powerboat! The captain swung it around in an expert maneuver and backed it into the slip effortlessly. Then he calmly stepped off the boat himself to cleat the docklines — without any assistance from anyone. Wow. These yachts and that kind of seamanship are the stuff boating dreams are made of. More of our Latest Posts and Quick Pics are in the top MENU above. Taylor Guitars Factory Tour – What a great company! To help you plan your cruise and get you inspired, we created the video series, "Cruising Mexico Off the Beaten Path - Volumes 1-3," shown below. This is a fun-to-watch and easy-to-digest introduction to Mexico from a cruiser's perspective, giving you lots of valuable information that isn't covered by the cruising guides. Each video is available individually at Amazon, either as a DVD or as a download. For discount package pricing on the whole series, visit our page Cruising Mexico Video Series. Volume 1 (left) reviews the geography, weather and seasons in Mexico and shows you what the best anchorages between Ensenada and Manzanillo are like. Volume 2 (middle) gives detailed info that can't be found in any of the guidebooks about the glorious cruising ground between Manzanillo and the Guatemala border. Volume 3 (right) provides all the info you need to get off the boat for an adventure-filled trip to Oaxaca. Our Gear Store also has a boatload of ideas for your cruise!